I love Valentines Day. I really do. I don’t understand the seemingly widespread dislike of it (at least judging by my Facebook feed this year!) and the accusations of it being ‘commercialised’ and ‘invented by card shops’ as it clearly isn’t, it dates back to the Middle Ages! I especially don’t understand people who say “I don’t need a set day to tell my other half I love them.” Fair enough, none of us do. Or we shouldn’t. Me and Ben say I love you every day, often multiple times a day, but still we enjoy a chance to celebrate our love and spoil each other. And, I love the idea that lots of other couples all around the world are doing it at the same time. So, V-Day 2012. Bit of an annoyance as it was a Tuesday night, possibly the most un-romantic day of the week. But we made it work. We decided against going out for dinner and paying extortionate amounts for a lame-o set menu with a ‘free’ glass of lukewarm bubbly and opted instead to stay in with a home-cooked dinner. I’d had an idea in my head for quite some time and I decided Valentines Day would be the perfect time to put it into action. We haven’t stopped talking about that pizza since. 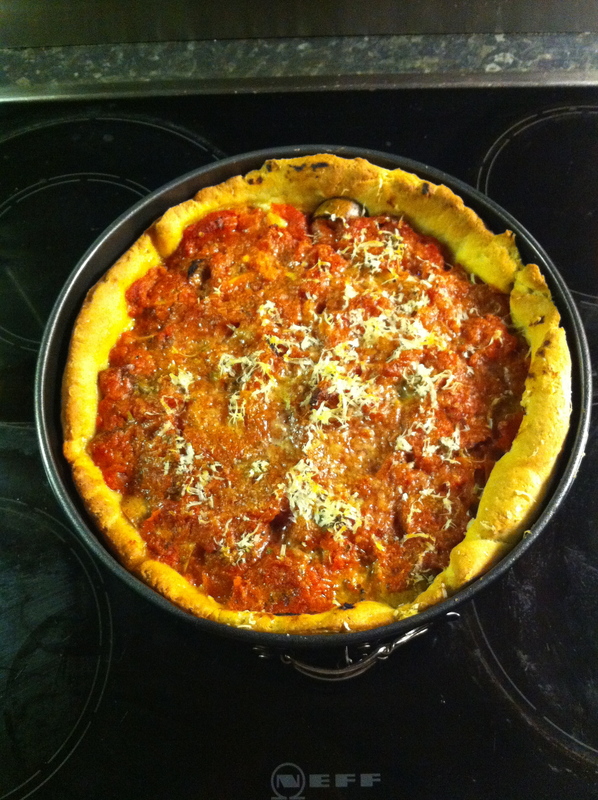 Unfortunately, it seems you cannot get a deep dish stuffed pizza over here for love nor money so it was becoming clear that my only option would be to create it from scratch myself – a nerve-wracking concept as the only time I’d made pizza dough was at school! A depressingly long time ago. A couple of weeks before Valentines Day I was so excited about my big plans that I designed a little menu for the evening and gave it to Ben whose face lit up when he read it. I added a spinach and artichoke dip for a starter, (another hard-to-find favourite from our holiday!) Mickey rice krispie treats for dessert (these need no introduction for hardened Disney fans but if you are not, have a look here) and a dress code of ‘Disney’ which we actually didn’t really follow as we decided to dress up nicely instead. On the Monday night I was in the kitchen for three long hours preparing most of the food, so that I could enjoy a nice relaxed evening with my sweetie the next night. 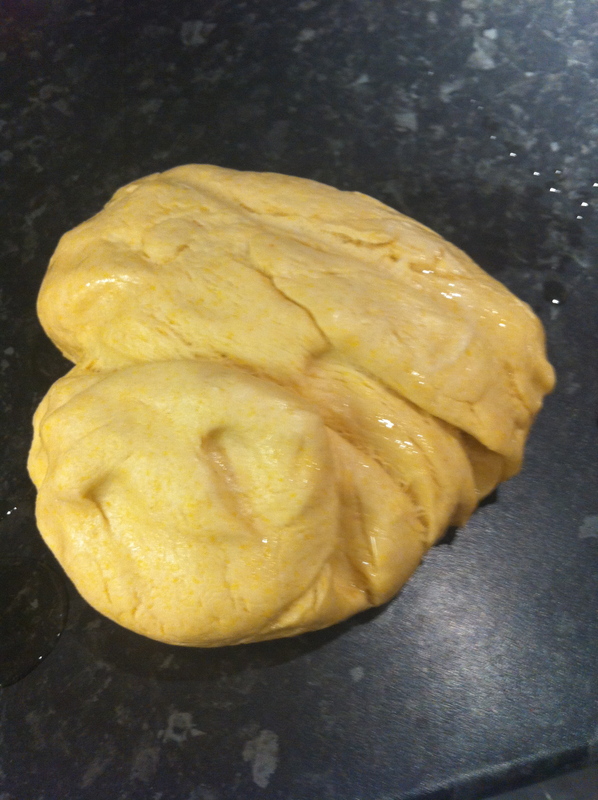 Up first was the dough. I had my beautiful pink Macbook Pro on the side with about 8 tabs open, all holding different blogger’s versions of the Cooks Illustrated recipe, plus a YouTube video of the pizzas being made. You know, just in case. Here is the Cooks Illustrated recipe that I followed, kindly posted by Thirty Bucks a Week. 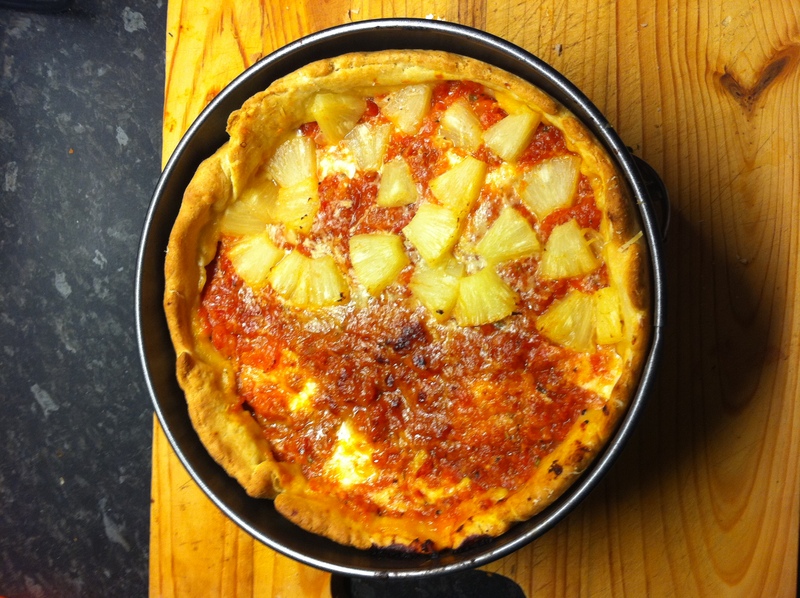 I chose it firstly because it seemed to be universally popular with multiple accounts of successful recreations, and secondly because it made two 9′ pizzas which coincided nicely with my Mum’s two 9′ cake pans. First up, all the dough ingredients went into the bowl of my Mum’s brand new super shiny KitchenAid where they were mixed into a lovely plump ball. I left it to rise for an hour while I got on with prepping the other two courses. 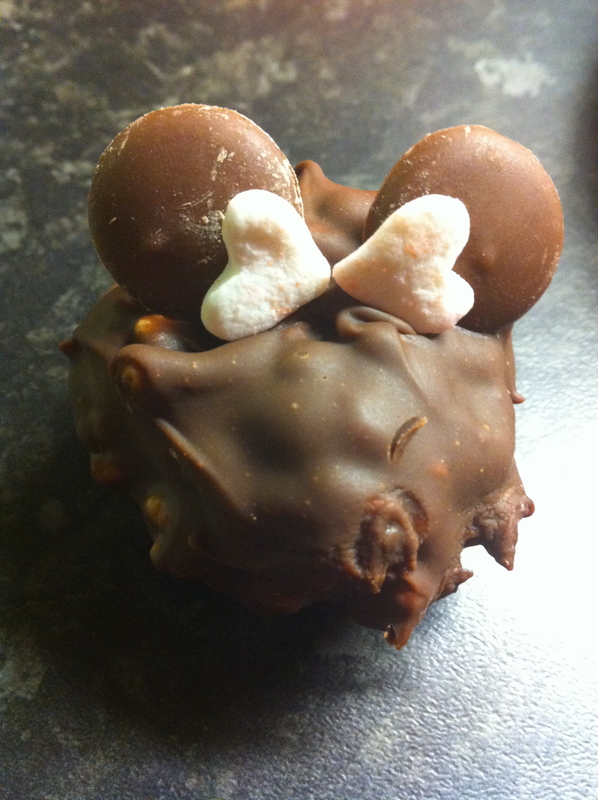 When I took it out it looked like this – unintentionally heart-shaped, how quaint! 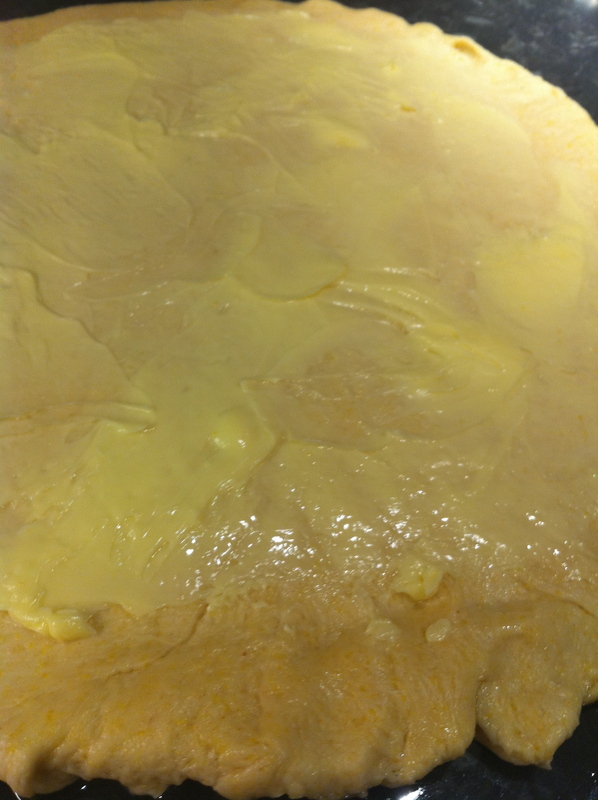 Next up was the laminating – spreading a thin layer of butter on the dough and then rolling it up to make the dough flaky, buttery and crusty. Mmmmm. Worked perfectly! I split the dough in two, rolled them into perfect little ovals and placed them side by side in a bowl in the fridge where they would sit patiently overnight, awaiting their grand reveal on V-Day. Then it was time to get down to business! I removed the laminated, risen dough from the fridge and rolled both balls out into discs. I then impressed Ben immensely by managing to whip the dough onto the cake tins first time using the classic rolling pin trick. Genius! I flattened the dough into each cake tin and it fit perfectly. 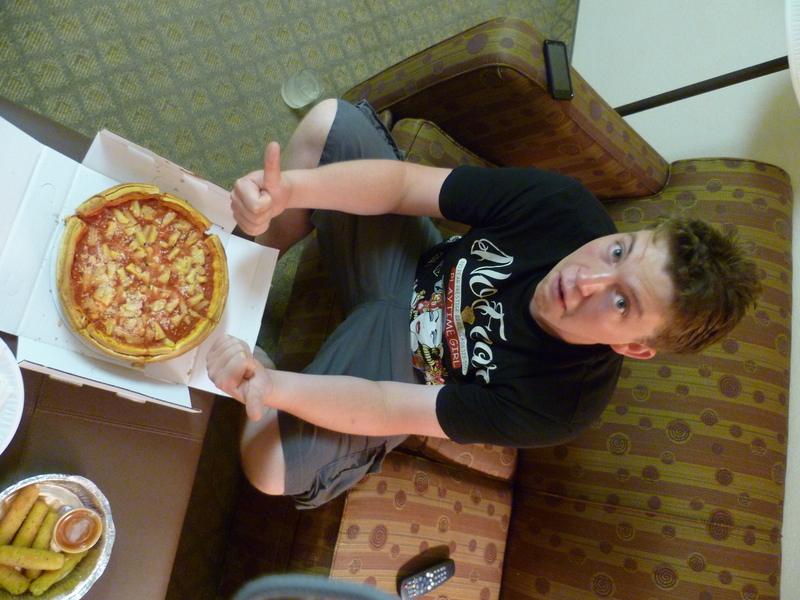 Check out that hiiiiighhhh crust! It was shortly after this photo was taken that a minor disaster happened. I went into the fridge to get the mozzarella out to start layering on the dough…and there was not a shred of mozzarella in sight. Oops! We must have left it in Ben’s fridge…at his house…15 minutes away by car when you haven’t had the best part of half a bottle of champagne. 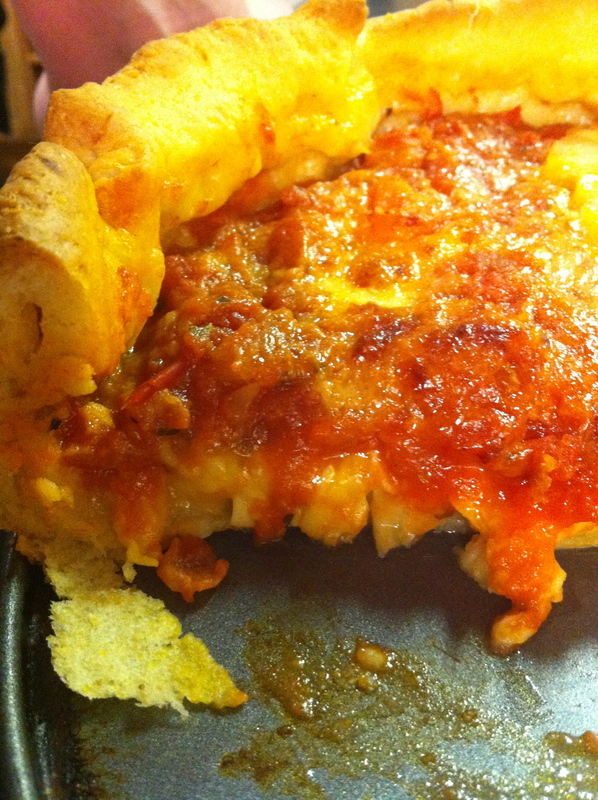 I started to panic with visions of a cheese-less deep dish pizza and a ruined Valentines Day. In no time at all he was back, two bags of grated mozzarella AND a bonus ball of buffalo mozzarella, “because it was cheap.” God I love you. We were back in business! I made two pizzas with different fillings so we could experiment a bit. One was plain cheese with one half topped with pineapple (to recreate the magic of Giordano’s) and the other had sliced Quorn sauasges in between the (homemade!!) 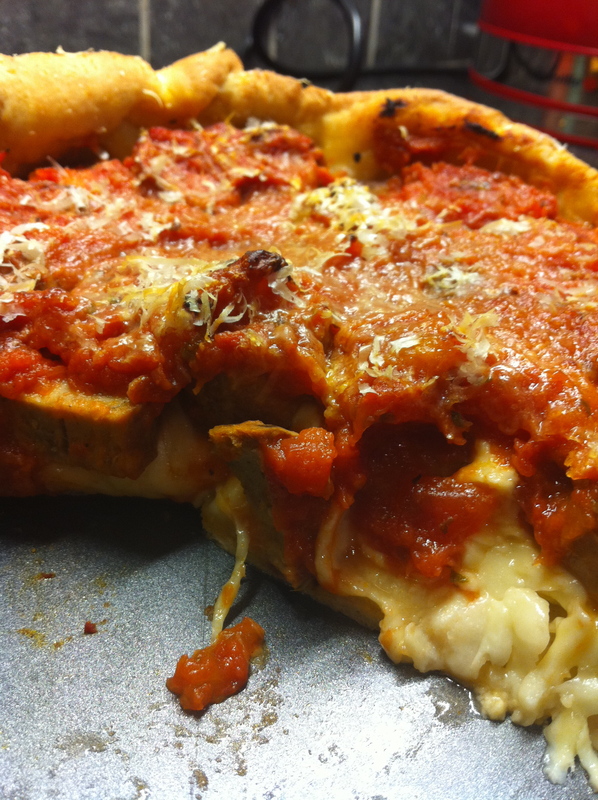 tomato sauce and the cheese. 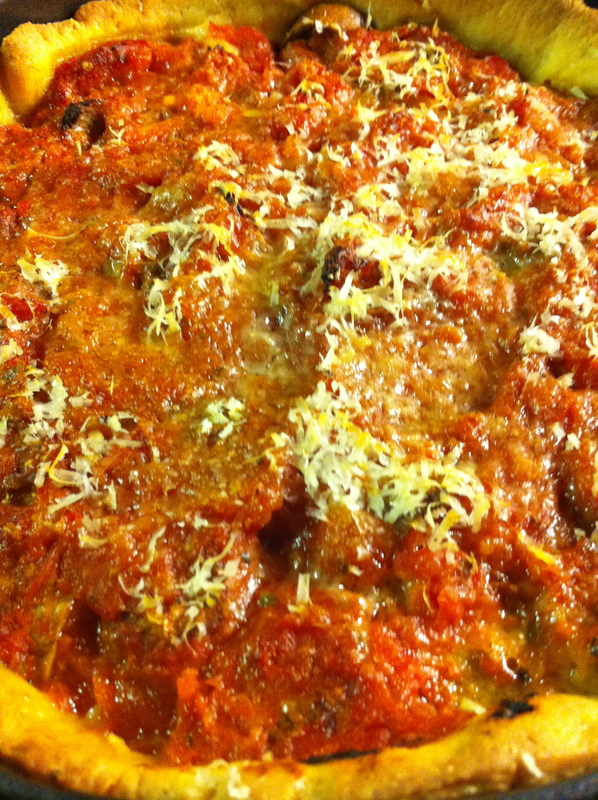 We layered the pizza, cheese, filling, tomato sauce and a sprinkle of parmesan, and they were ready for the oven. As they cooked, we ate our spinach and artichoke dip which I’m afraid I neglected to photograph because frankly, mozzarella-gate had somewhat thrown me off course. It was really lovely though. In a perfect timings situation, our pizzas were ready just as we finished our dip. You just can’t make that stuff up. I left them on the side to cool for a bit as we cleared away the dip debris, as advised by my fellow stuffed-pizza-makers. 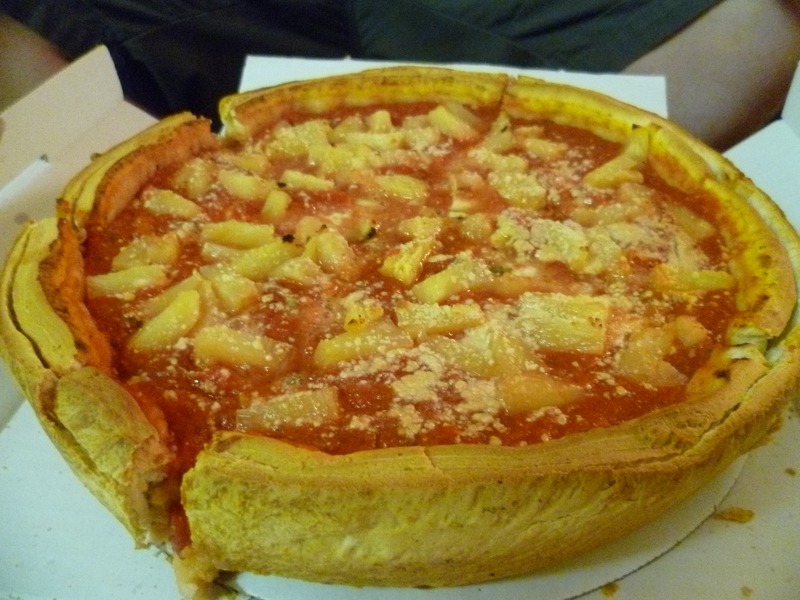 This would make them easier to slice. I took the opportunity to take some photos while we waited and honestly you’d have thought they were newborn twins in the baby ward the amount of cooing and ahhing that took place as we gazed at them. 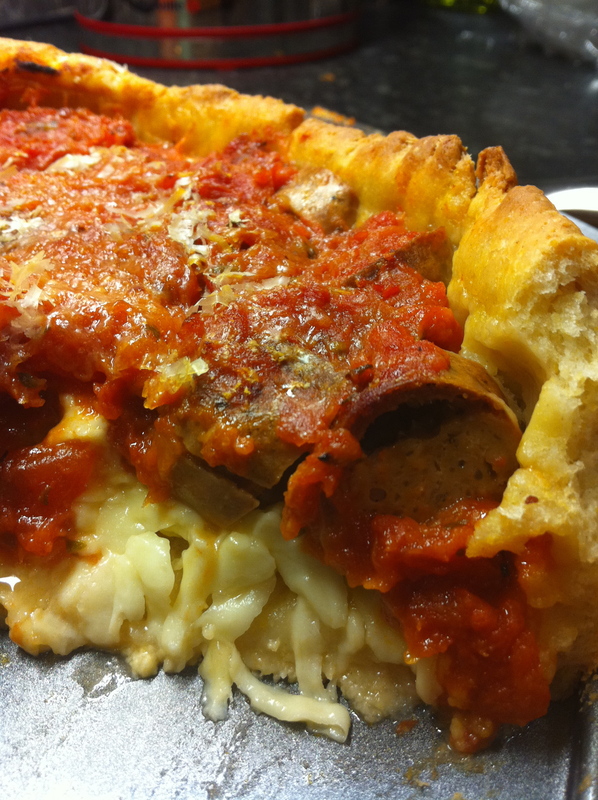 And the finale of any deep dish pizza recipe…innards shots! They were incredible. Cheesy, cheesy, cheesy! 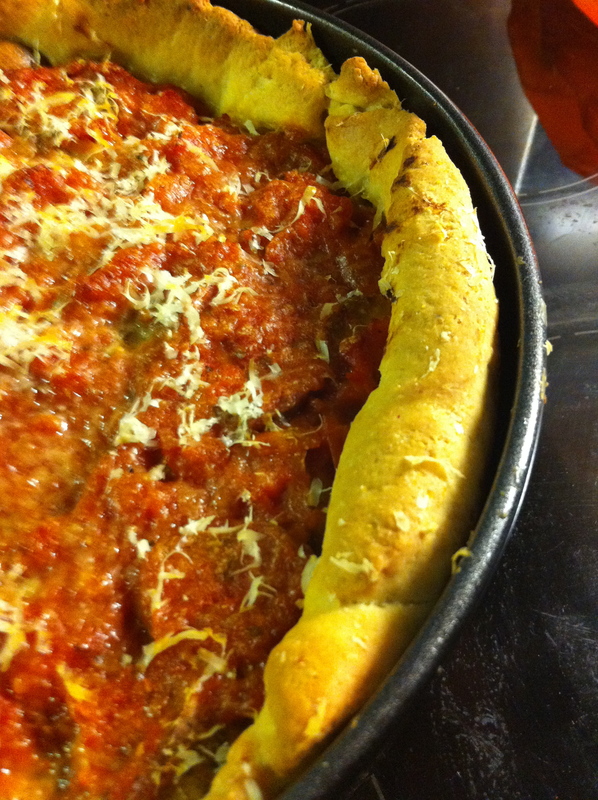 The crust was perfect – it tasted EXACTLY like the Giordano’s one…dare I say it, better! It was flaky, buttery and rich. Delicious. It cooked perfectly in the amount of time stated on the recipe too even though I was afraid the bottom wouldn”t crisp up, it did! The tomato sauce was probably the best one I’ve ever tasted – grating the onion and cooking it really slowly as per the recipe made it so intense and deep, I’m glad I didn’t buy a sauce like I was originally planning to. Obviously this makes a lot of pizza so we had leftovers for the next day…and the next! Easily fed 2 of us for 3 meals. 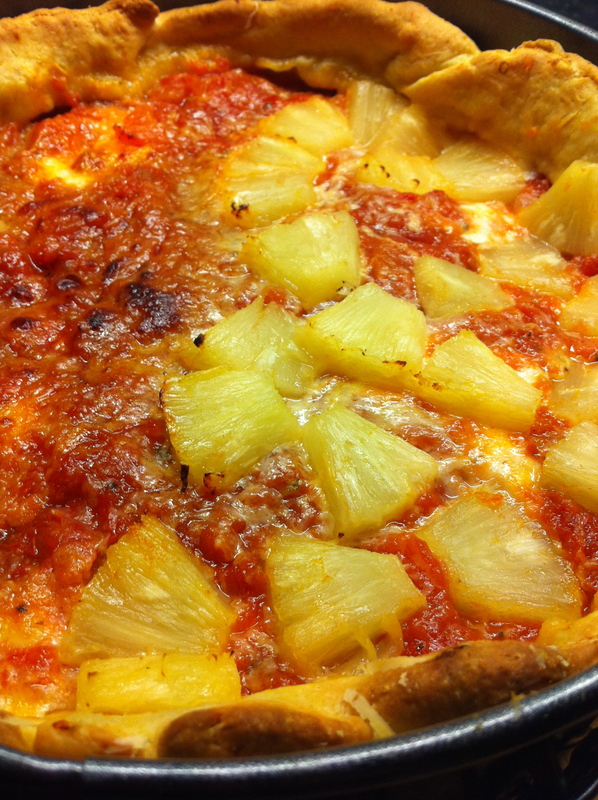 I was so thrilled that my pizzas had turned out perfectly that I didn’t even care about dessert! Honestly, I was on a dough-based cloud 9. But, I had a boy to feed, and dessert was the cutest part! They looked really cute on the plate and they were really delicious but we’d unfortunately eaten so much pizza that we could only manage once each! 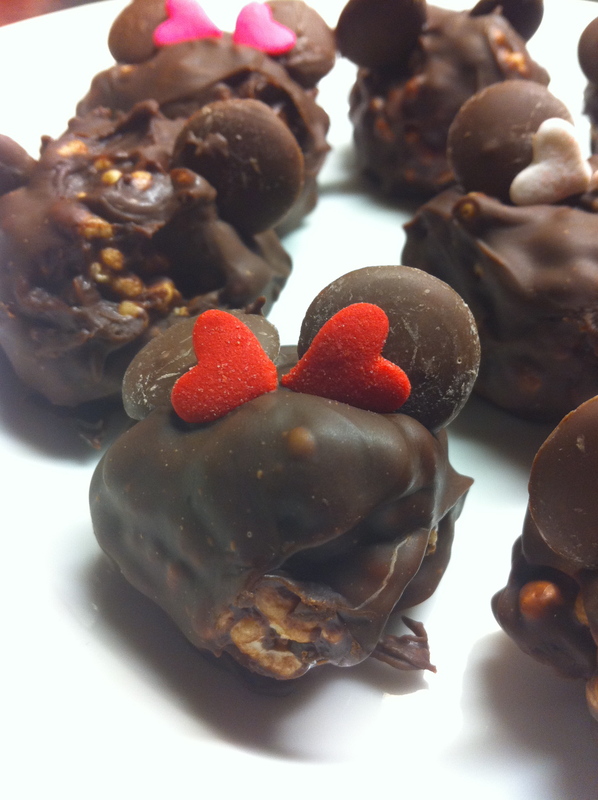 These also worked well as leftovers so in fact our Valentines Day stretched to accommodate the best part of the week! Overall, a very successful Valentines Day and one of our best to date. Happy Valentines Day Ben, roll on next year! 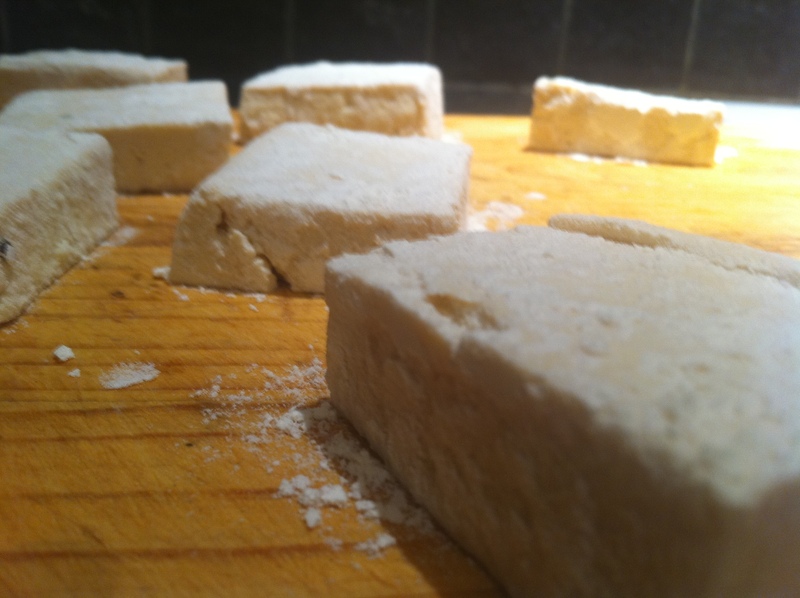 So, we’ve been experimenting with tofu a lot recently. Following the success of our Mediterranean tofu scramble I wanted to try something completely different and see the other side of this wondrous soy product. In fact, I wanted to see the dark side. 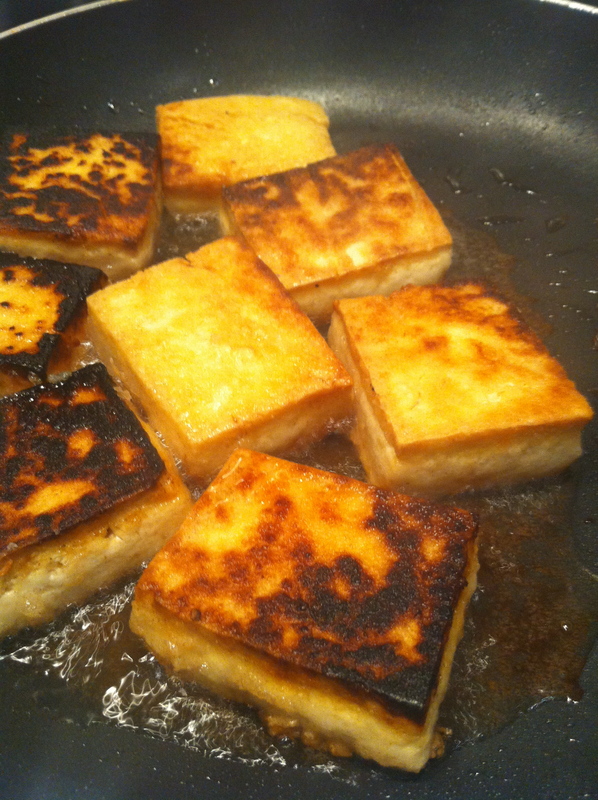 The time had come for…crispy fried tofu! 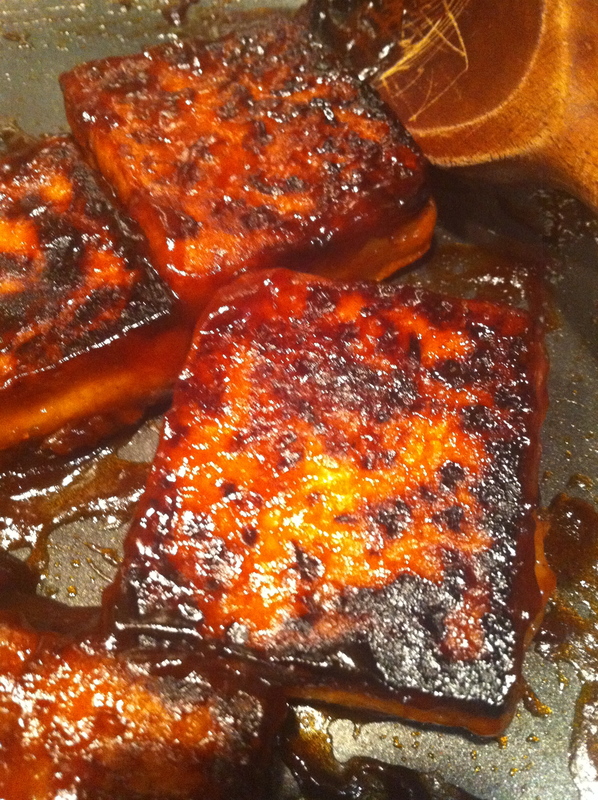 A lot of peoples misconception of tofu is that it is always pale, bland, mushy and flaccid. Which it is. But, it can really reach quite alarming levels of deliciousness with a little TLC and a very hot pan. 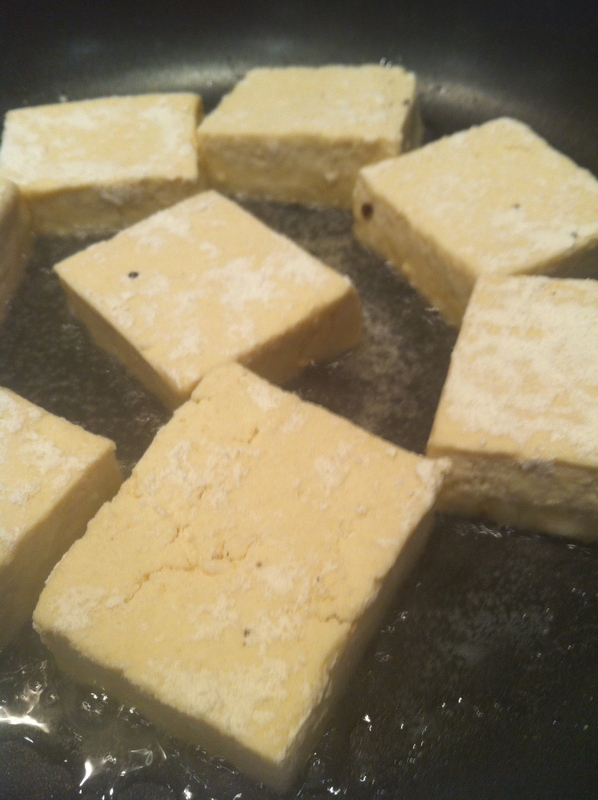 I pressed the tofu for about half an hour, sliced it into square slabs and dipped each slab into seasoned flour – the key to getting a super crispy edge. I then carefully added them to a hot pan of oil and left them for about 10 minutes, turning every so often to momentarily relieve each side of it’s immersion in the oil. After a little while they started to look like this! 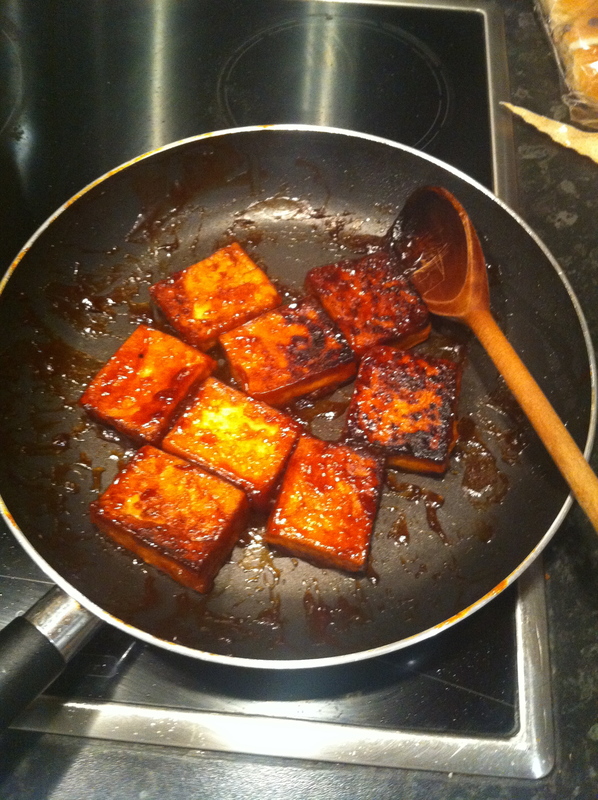 Complete transformation and in my opinion proof that tofu can look appetising! 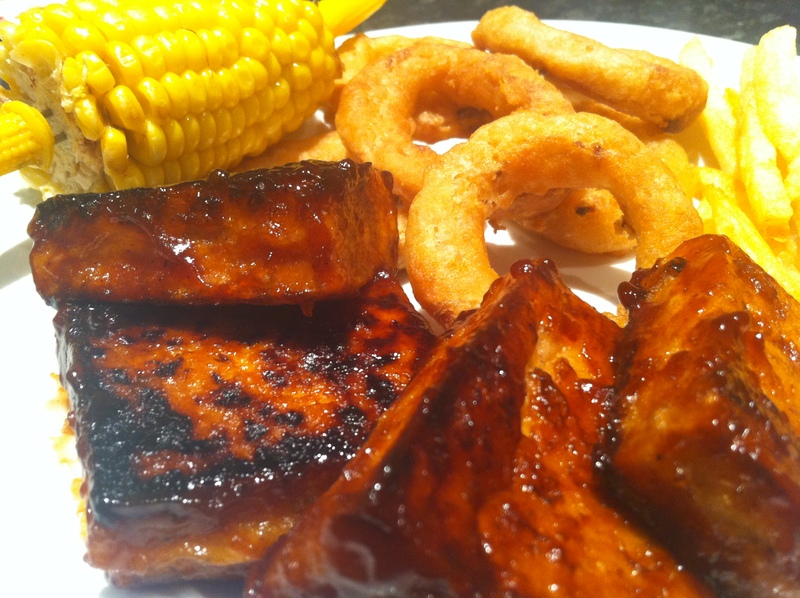 I added barbecue sauce (combination of leftover jarred BBQ sauce, ketchup, honey and soy sauce) to the tofu and left it to hang out in the pan for a little bit while we plated up our extremely classy, circa-1981 pub grub accompaniments – fries, onion rings and a corn on the cob. Niiiiiice. The result was really, really good. 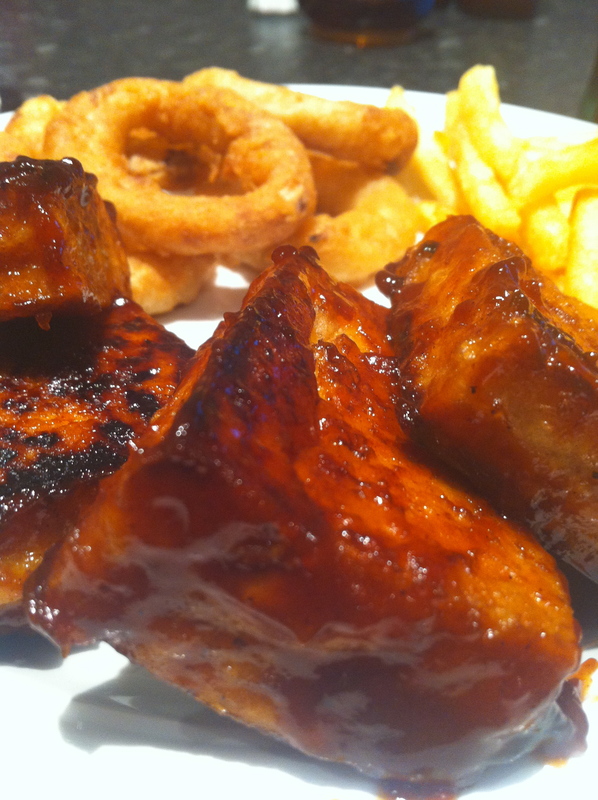 The texture of the tofu had changed completely; crisp, crunchy edges with caramelised BBQ sauce and a soft, pillowy centre. Amazing! Immediately promoted to the top of the Regular Dinners list, clever tofu! We were in London the weekend just gone for a friends birthday and stumbled on this amazing little food market while wandering around Waterloo station before catching our train home. 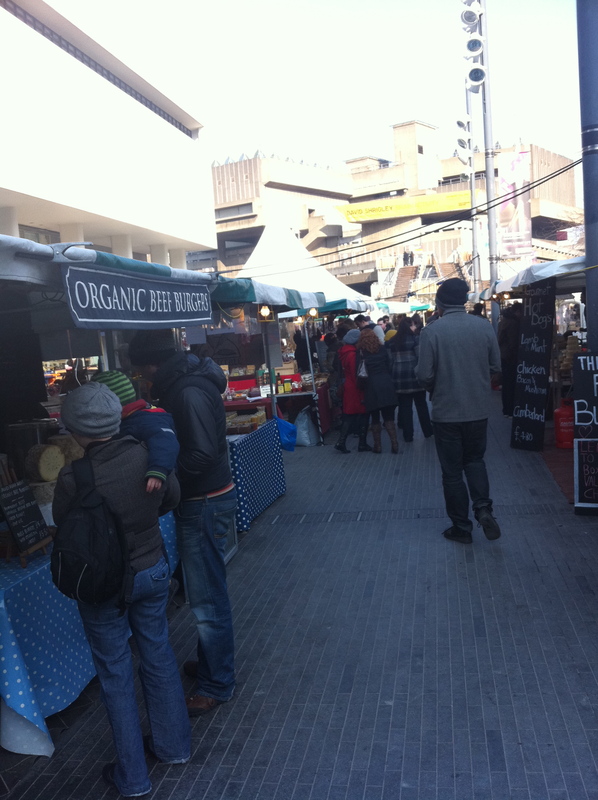 The market is just outside the station on the way to South Bank and we were so surprised to see it! 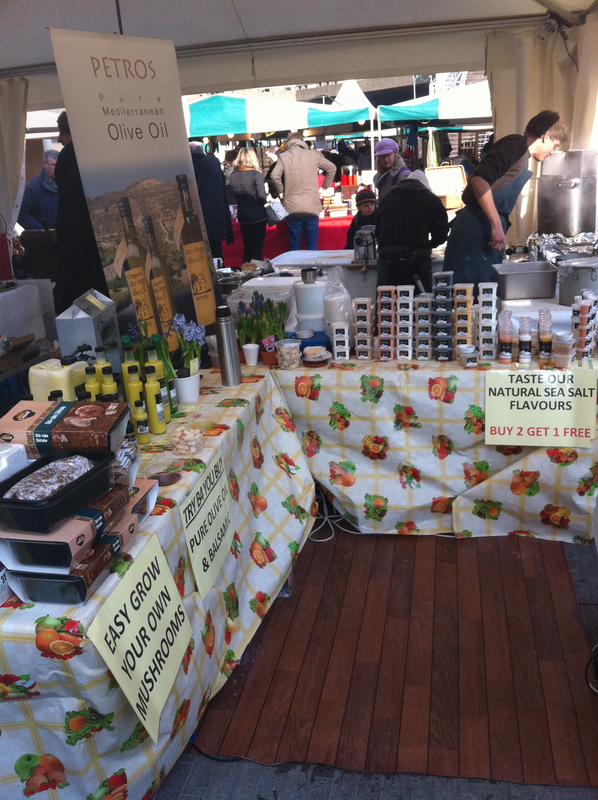 It was really busy when we visited (about 12.30pm on Saturday) and we immediately jumped in to start exploring the stalls. 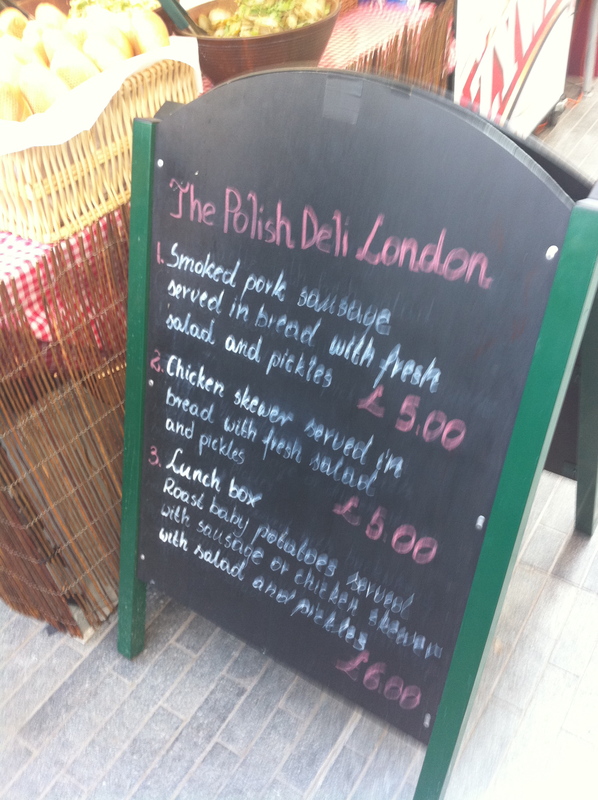 It needs to be mentioned that we were both pretty hungover after taking full advantage of London’s generous drinking opportunities and the discovery of a food market was perhaps more enthusiastically received than it would usually have been. Grow your own mushrooms! Amazing! 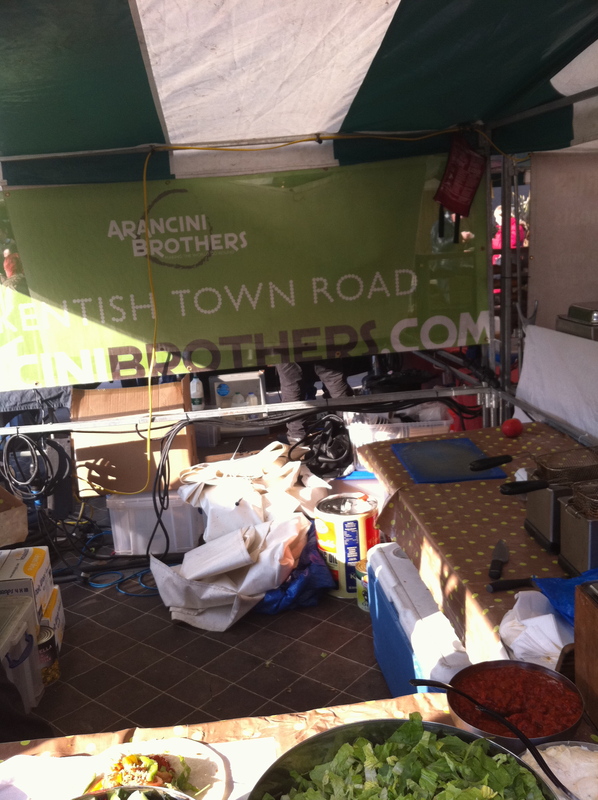 After sampling some rich, aged balsamic vinegar and various types of cheese and bread, we stumbled on this wondrous sight – Arancini Brothers. I have seen arancini on so many food blogs recently but I’d never had the chance to try them so I was beyond excited to see this stall! 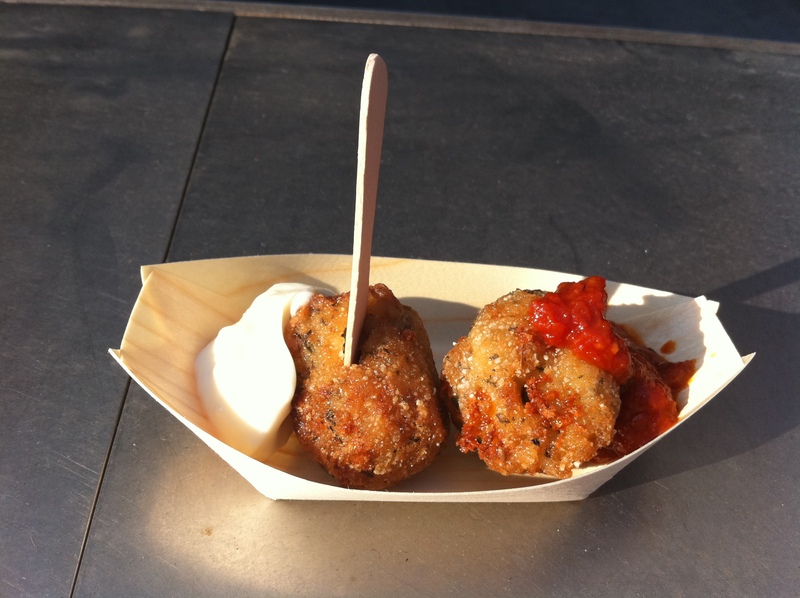 For those that don’t know, arancini = fried risotto balls. Yum! 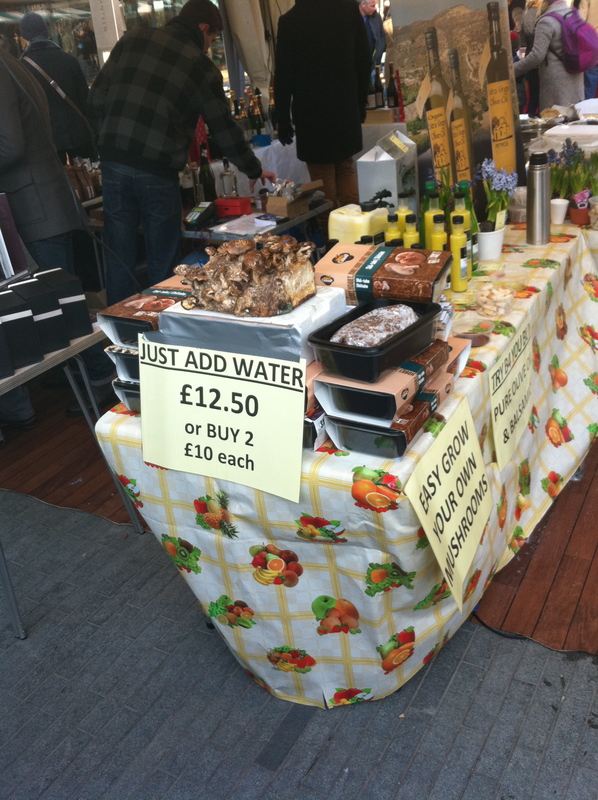 Ben was overjoyed by the prospects of this stall and immediately gave the guy (an Arancini brother?) 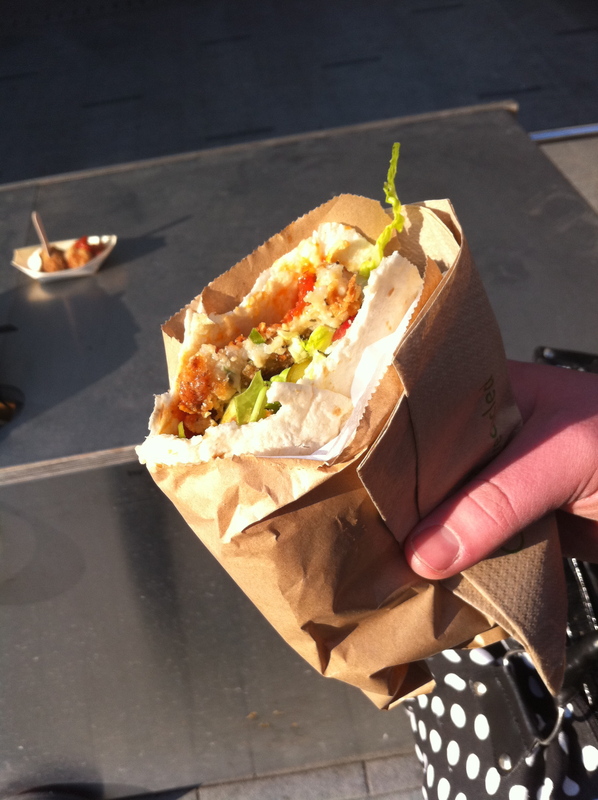 his order – two arancini in a salad wrap. The guy set about making his wrap and we watched in stomach-growling fascination. 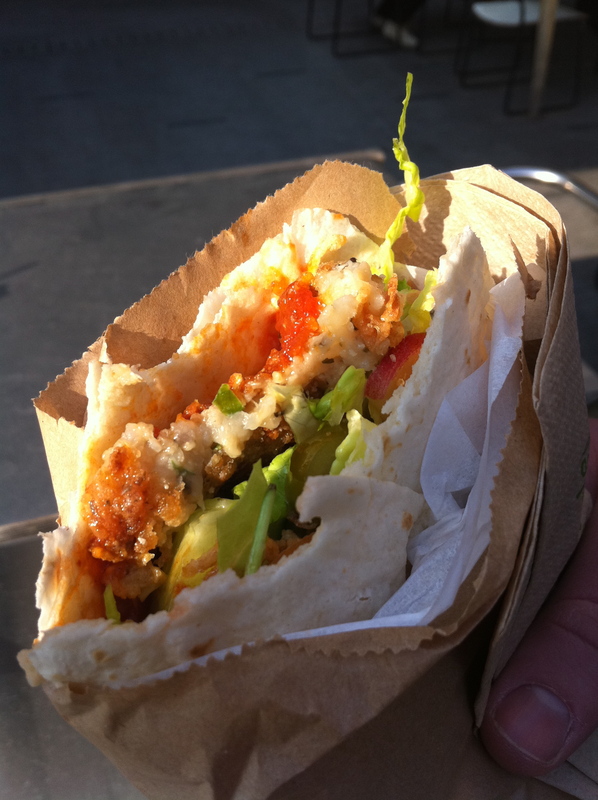 For an extremely reasonable £3.50 Ben got a deliciously fresh wrap crammed with two arancini and accompaniments of cucumber, tomato, sliced apple, crispy onions, chilli tomato chutney and homemade garlic mayonnaise. Upon receiving the wrap he clutched it to his bosom, visably drooling as I dithered about what to order for myself. I decided to just go for the two arancini on their own, which came with the tomato chutney and garlic mayo for an even more reasonable £1.50. They came very thoughtfully presented in a little bamboo dish with generous lobs of the sauces and a wooden fork for easy eating, always a bonus in my eyes. We thanked the Brother profusely and scampered over to a nearby table to stifle our hungover stomach lurches with our snacks. 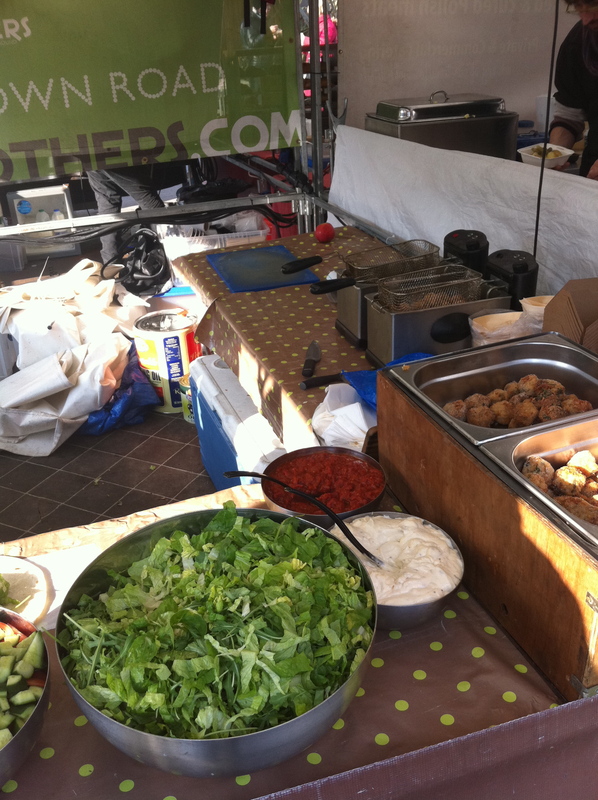 Arancini Brothers arancini are seriously good. They were hot throughout; crispy on the outside and sticky and soft in the middle. Each ball had a generous amount of breadcrumbs on the outside, providing a perfect contrast to the gooey cheese in the centre which was flavoured with flecks of spring onion, garlic and chilli. Both the chilli chutney and garlic mayo were delicious too and to be honest toward the end I was using the arancini more as a vessel to get the sauces into my mouth. Mmmm. Ben’s wrap was gone in a matter of minutes and he announced in a sorrowful voice that he wished he’d got the large, which came with 4 arancini. We have learnt from our mistakes and will be ordering much higher quantities next time. We seriously debated going back and buying additional fried items but we had a train to catch and wanted to see what wonders the rest of the market held. 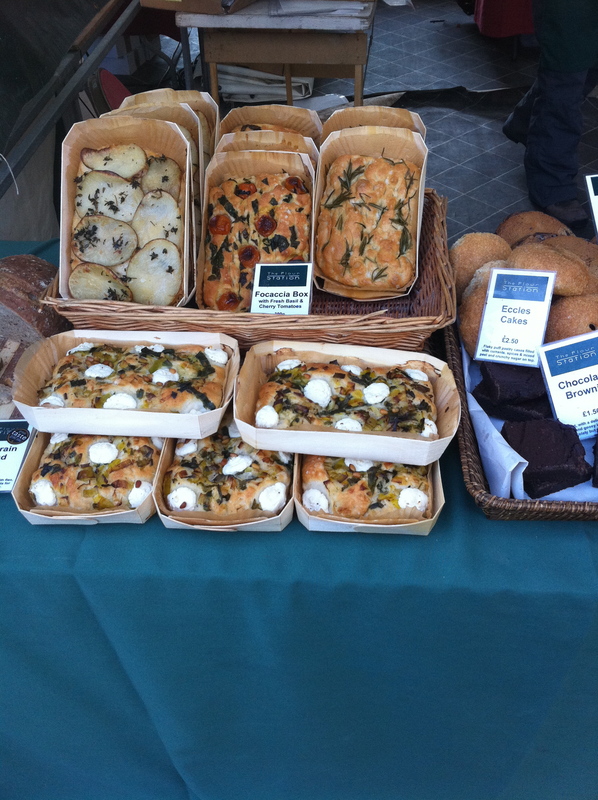 This focaccia looked and smelled incredible. 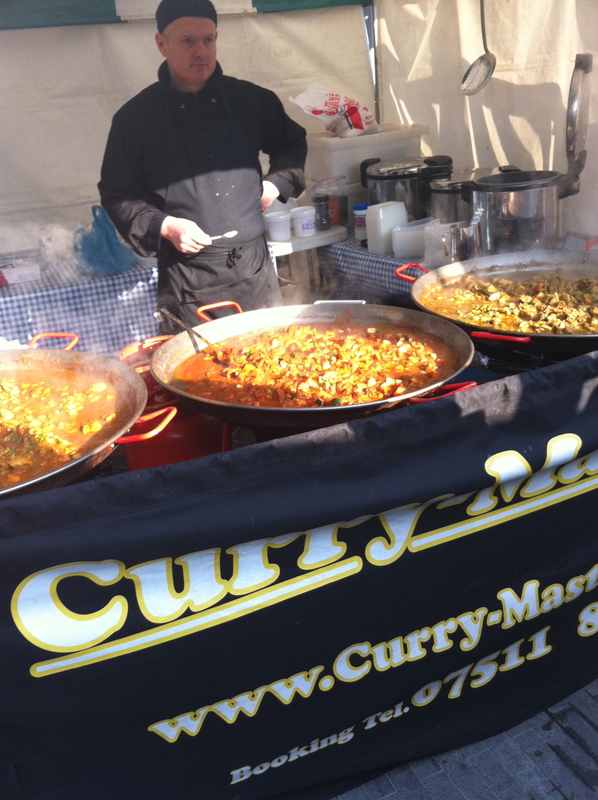 We were offered a lot of samples from the various stalls as we wandered round, the atmosphere was really friendly and jovial and you could tell all the stall owners were really passionate about their food. Always great to see! This garlic that made up this paste was roasted for a full 5 hours! I tried a sample and the flavour was so intense, I felt like I needed a sit-down! 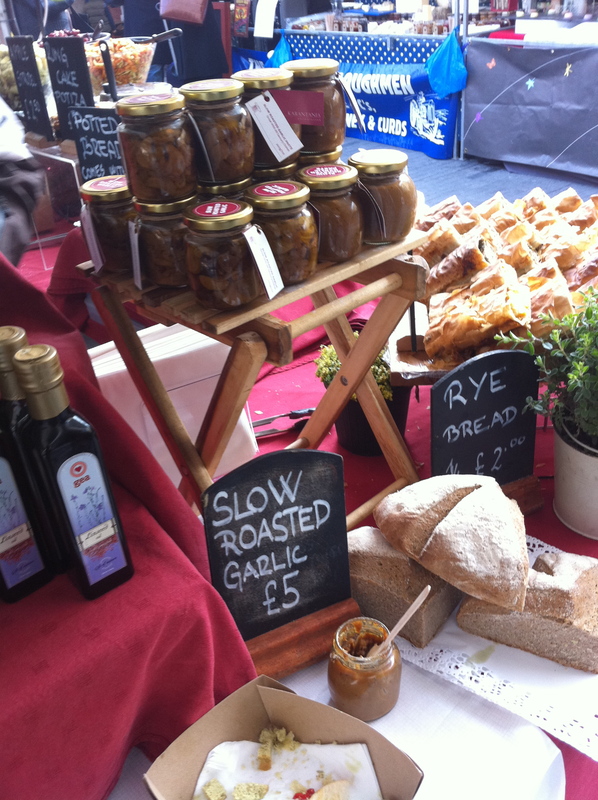 I really love garlic and I wish I’d bought a jar, we’ll have to go back so I can. I am actually slightly incredulous that this hasn’t come up yet on the blog….but I have a confession to make. A lot. Like, really a lot. I’d say any time I’m not thinking about food, I’m thinking about Disney. Disney holidays, to be specific. I won’t go into my entire back-story and tell you how and why this came to such a big part of my life (not sure if anyone is ready for that) but suffice to say I’m a little bit obsessed. My parents first took me to Walt Disney World when I was 7 and we went back numerous times as a family right up until I was 16. I was at college then and went on other non-family holidays to New York, Amsterdam and France but I never stopped thinking about Florida. I went to Disneyland Paris when I was 14 with a friend and her family and my parents surprised me with a wonderful trip for my 18th birthday. When I was 20 and just about to go to Uni, me and Ben went to Disneyland Paris for a short break, he loved it as much as I did and we returned in 2010 for an even longer break, staying on-site this time! Very exciting. On arrival back from our 2010 Disneyland Paris trip, I felt it was finally time to start thinking about going back to Florida (I say ‘start thinking,’ I’d never actually stopped) and we began researching. We both had full time jobs and for the first time there was actually a glimmer of light at the end of the Mickey-shaped tunnel. Fast forward a year and we flew to Orlando on 6th October 2011 for 15 amazing, incredible, unforgettable nights. I planned our trip for a whole year and think I could possibly go into business as a successful Florida travel agent now. We had a pretty packed itinerary. 7 nights on International Drive, 1 night at Universal’s Hard Rock Hotel and 7 nights at Disney’s Saratoga Springs Resort and Spa. We visited all four Disney theme parks, 1 water park, both Universal theme parks, Seaworld and Discovery Cove. It was a crazy, hectic fortnight but it was the best fortnight of our whole lives. And, more importantly, we ate the most amazing food I’ve ever eaten in my life! 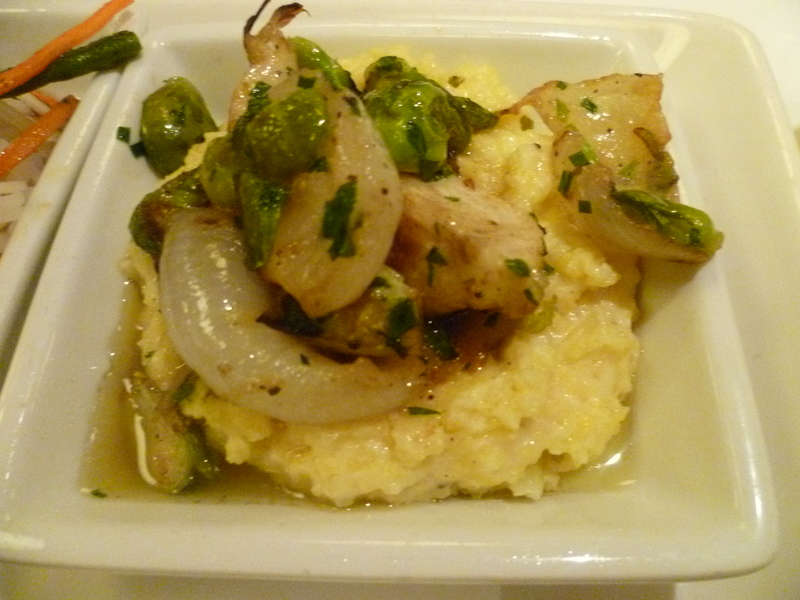 Which I’m going to share on the blog as I photographed pretty much everything we ate. It was a lot, trust me. I won’t post everything, just the best of the best. 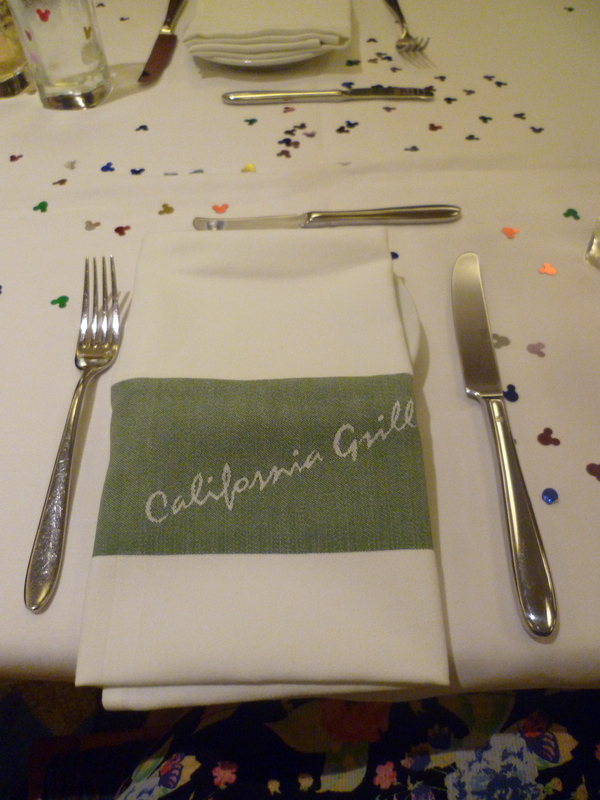 And, the absolute best, and a perfect starting point, was an amazing dinner at California Grill, a Signature Disney restaurant right at the top of the Contemporary Hotel. 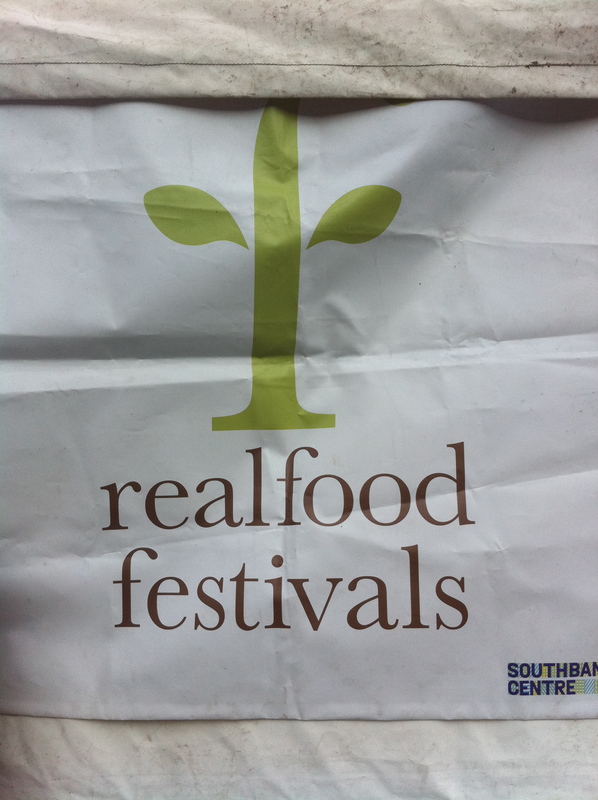 rill ADR 180 days before we ate there!) I also just have to share the beautiful roses that Ben had delivered to our hotel room the day of the dinner. Cute! Our ADR was at 7pm and we checked in at the podium on the first floor of the Contemporary. 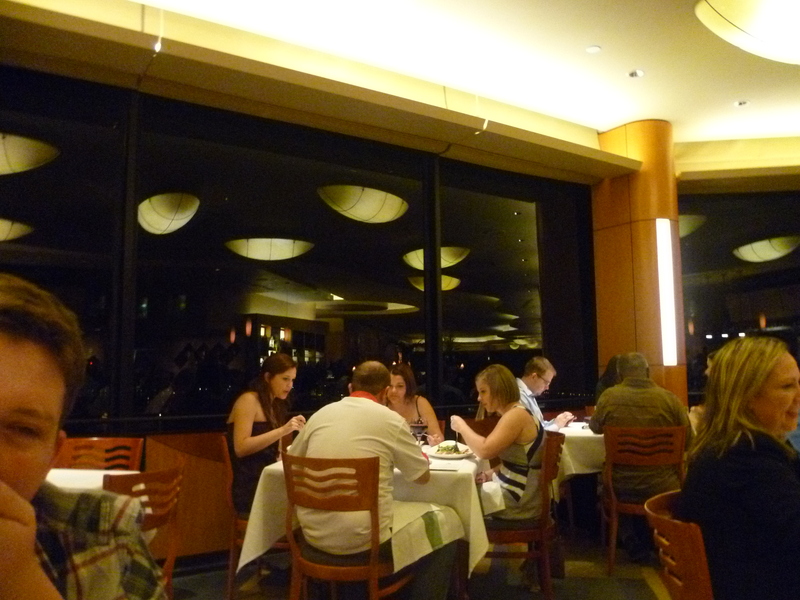 We were then taken upstairs in the elevator and led through the gorgeous dining room to a lovely table near the window. 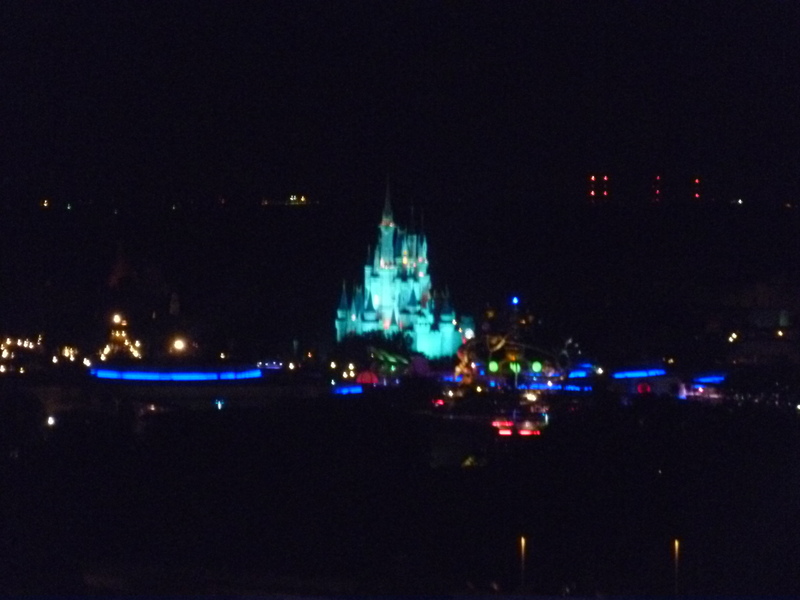 I was facing the window and I could clearly see Cinderella Castle changing colour in the distance which was fabulous 🙂 And look! 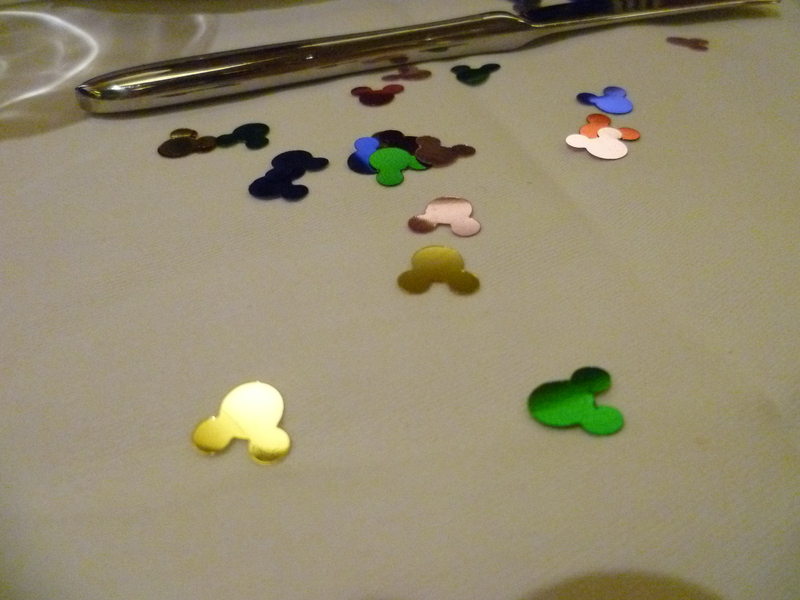 Our table was decorated! Starters first! 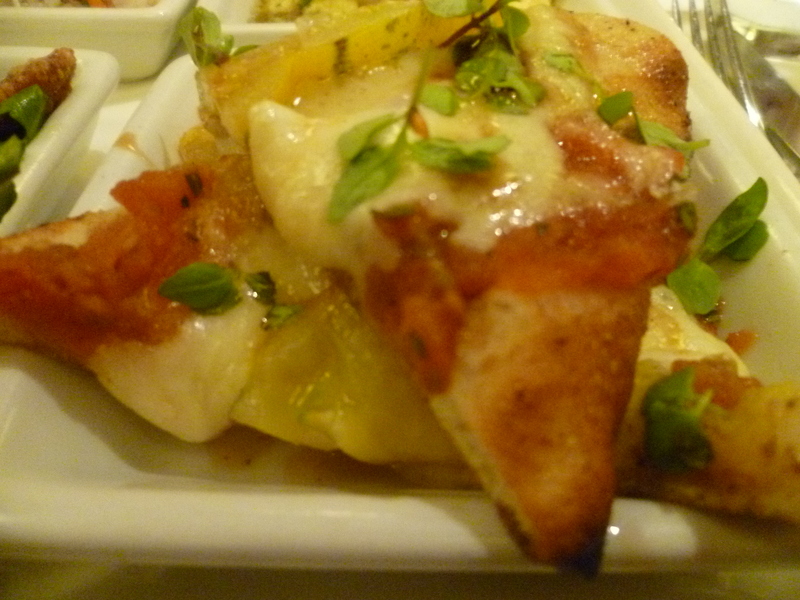 After much deliberation of whether or not I was going to try some of California Grill’s famous sushi, we decided to share the infamous goats cheese ravioli and the heirloom tomato flatbread. 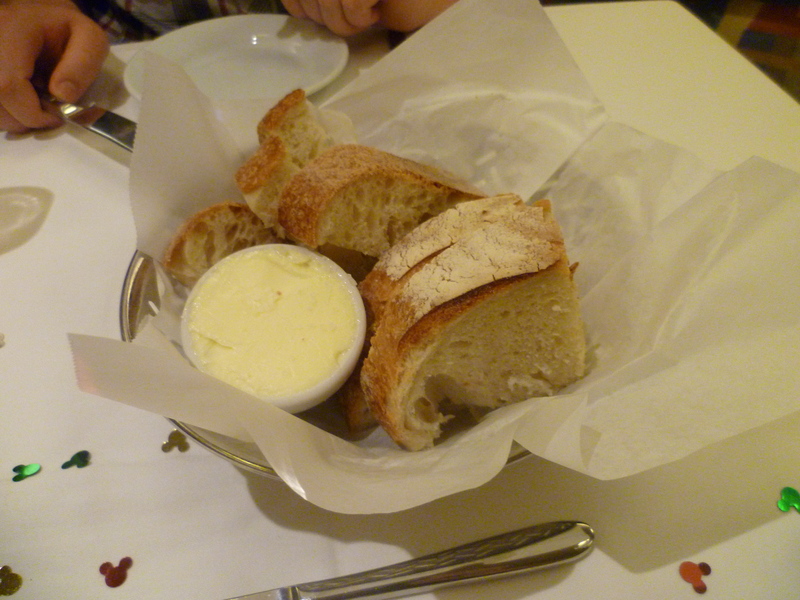 Once we had ordered, the bread arrived which was really lovely, real butter with salt on top and fresh sourdough bread. I’m a bit of a salt fiend so having salt on my butter was a huge treat and it tasted so good! Lets just say this was all gone quite quickly. Shortly after this our starters were brought out and Ben started with the flatbread while I had the ravioli and we planned to swap half way through. 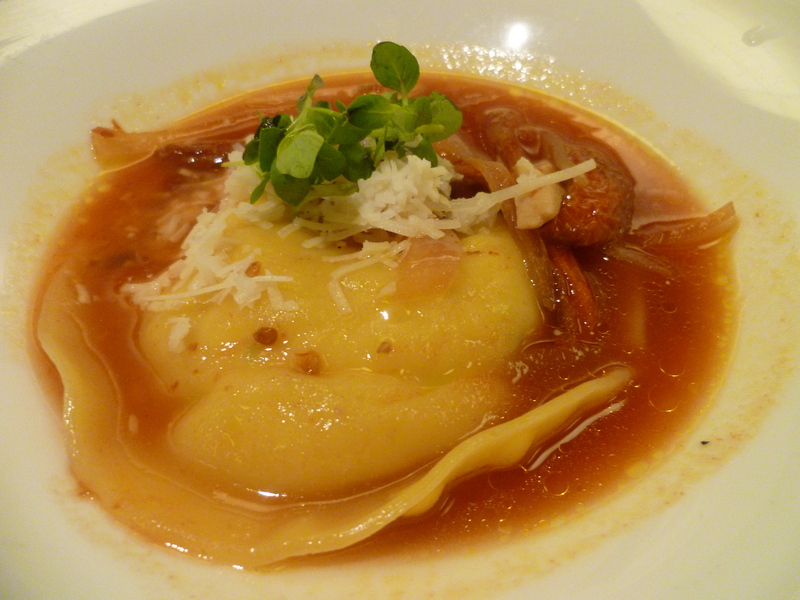 Sonoma Goat Cheese Ravioli – With sun dried tomatoes, pesto, shiitake mushrooms and basil. I eagerly tucked in…but it was not to be! I didn’t like it! Disaster and very unusual as I do not meet many foods I don’t like. 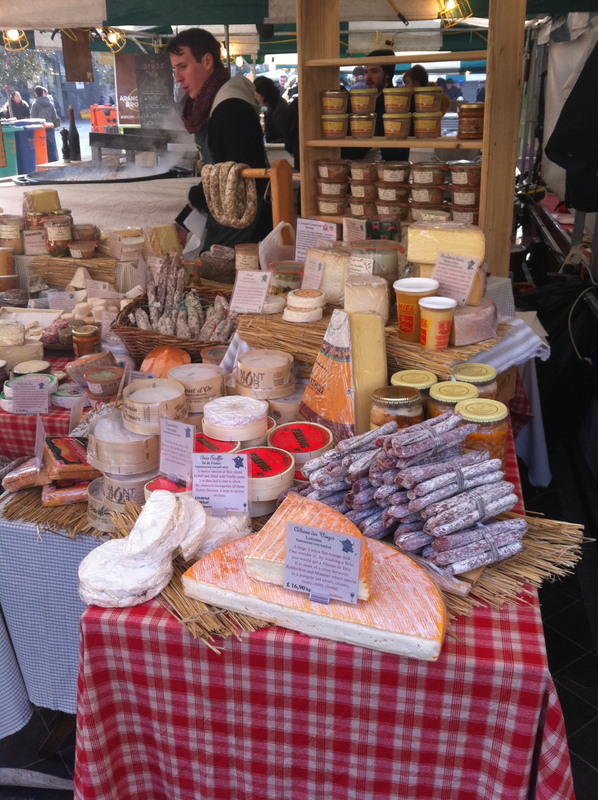 Also, I absolutely LOVE goats cheese and will slather it on just about anything normally. It was just too strong for me, I’ve never had anything like it. Ben had eaten half of the flatbread by now and barely spoken during this time only to breathlessly declare it “one of the best things I’ve ever eaten in my life” so we swapped. 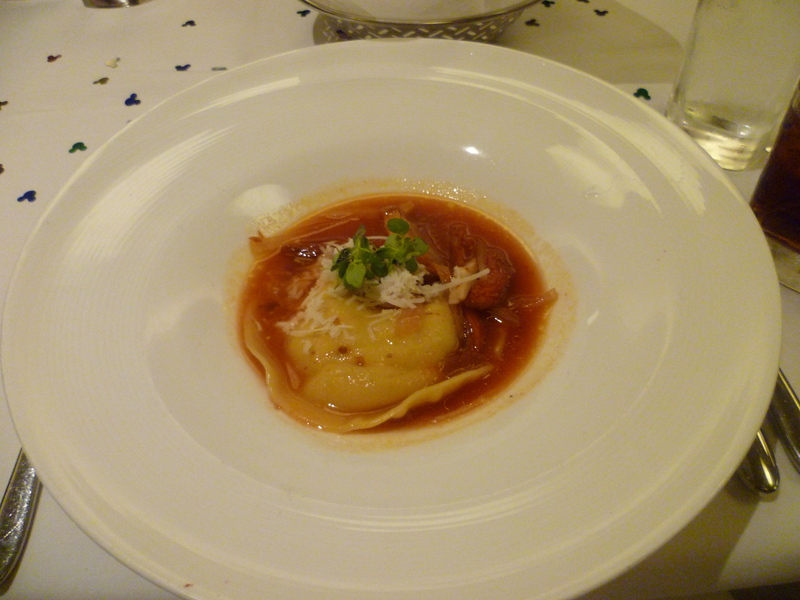 And he loved the ravioli! So each to their own. The flatbread however, oh my lord. This was heaven on a plate. 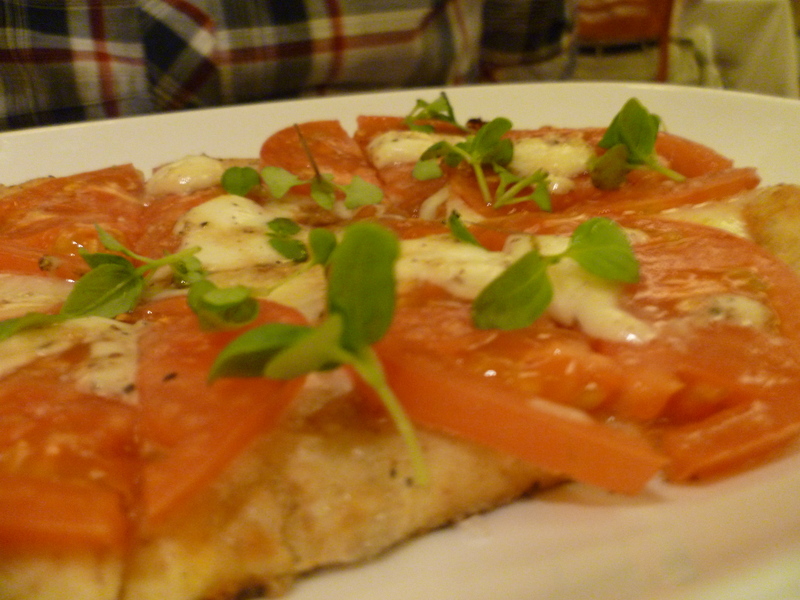 Brick oven Fired Flatbread – Chef’s Garden Heirloom tomatoes, baby mozzarella, tomato Jam, micro basil. It was so delicately flavoured, I have never had tomatoes that taste like that before, wow, and the micro basil just took it to the next level! It literally took me seconds to eat my half of the flatbread. Our server then came to clear our plates and he came back to ask us what we wanted for our main courses. 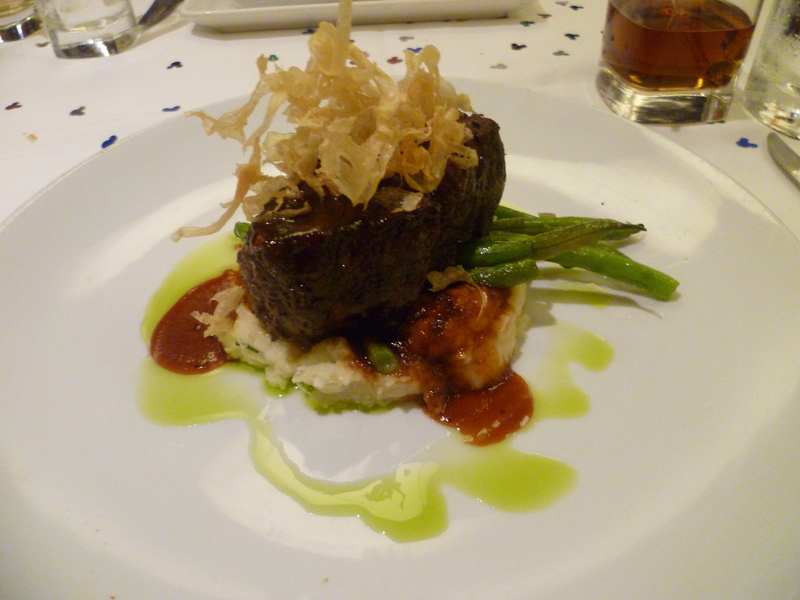 I had known what I was going to have for approximately a year, CG’s signature Oak-Fired Fillet of beef. Done! While I was dreaming of the steak, Ben was musing over his options. That’s right, options plural! He could have had the veggie dish of the day which I believe was a fettucine affair, or a plate of vegetarian sushi. But, I was really trying to persuade him to ask about a dish I had read about a few times on various Disney vegan/vegetarian dining reviews and thought Ben would love…the lesser-spotted Vegetarian Unplugged! Basically it’s a plate made up of 4 little plates that each holds a different dish that gets passed around the kitchen and made by 4 different chefs. He decided to go for it and very bravely said to our server “I’ve heard about a dish called Vegetarian Unplugged…are you serving it tonight” and the server was like of course! Coming right up! With that he was off, leaving us to wait in almost unbearable anticipation. And luckily, we didn’t have to wait long. Our main courses arrived with a flourish and we sat staring at them for a good while before we tucked in. 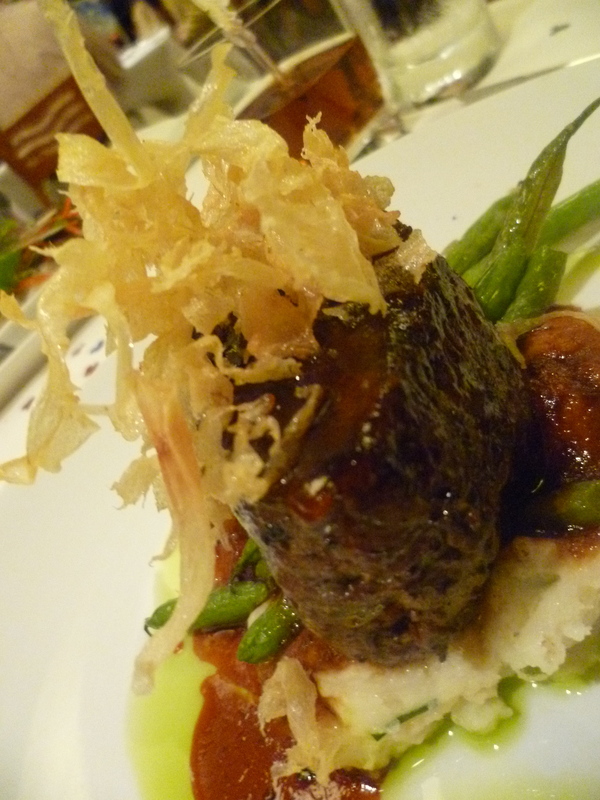 Here is my absolute beauty of a steak…Oak-fired Filet of Beef – Mascarpone Potatoes, Blue Lake Beans, Arugula Oil, and Teriyaki Barbecue. 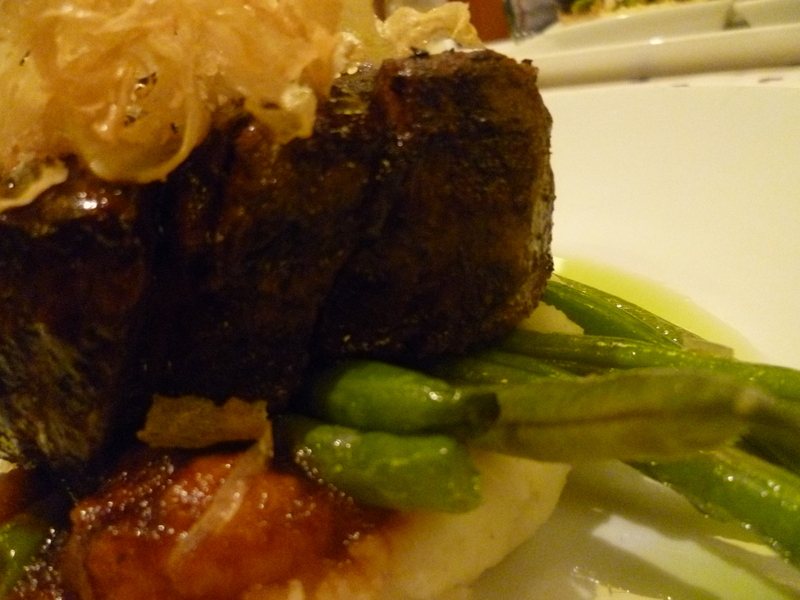 It was incredible; tender, flavourful steak, delicious, fluffy mashed potatoes and a rich barbecue sauce. One of the best things I’ve ever eaten in my life, it definitely warrants three photographs! 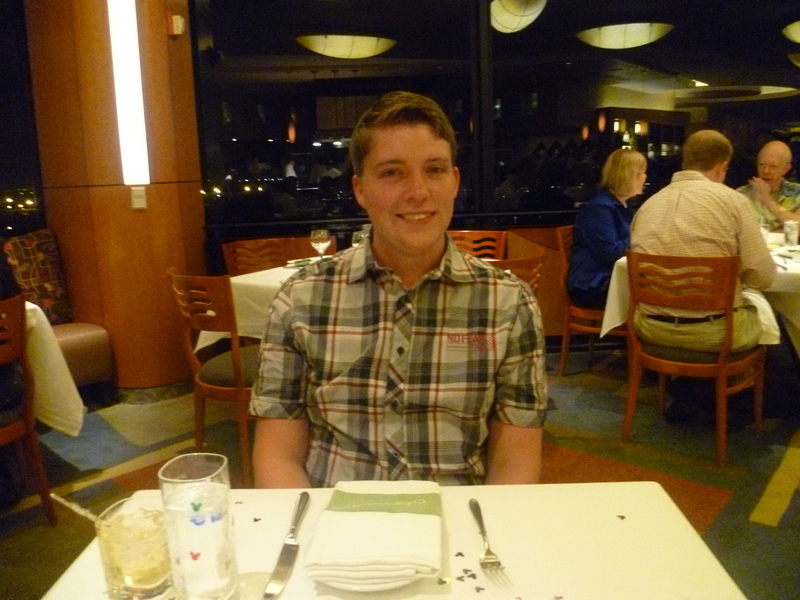 And Ben’s main was also incredible, he was so pleased he chose it! 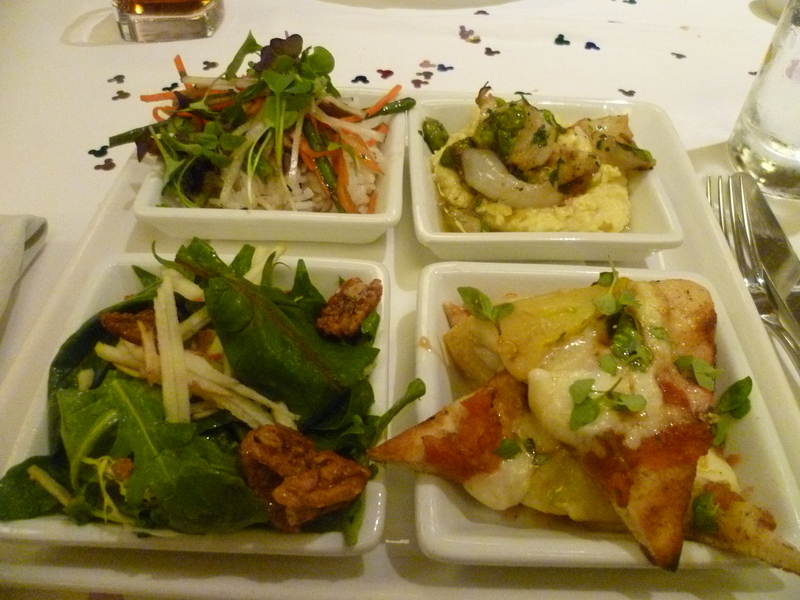 I’ve had to guess what each dish is as we weren’t told but I think I’ve pretty much got it from studying various menus. Top right – I’m pretty sure this was the side dishes of the pork tenderloin, minus the meat. Goat Cheese Polenta, Roasted Mushrooms, Zinfandel Glaze and Sage which was fabulous as I got to try the very tasty goat cheese polenta. Bottom right – recognize this? 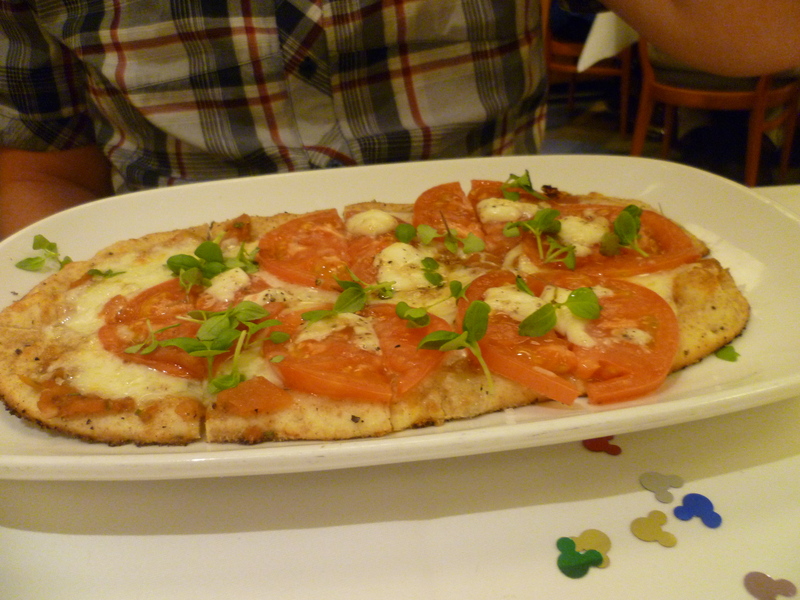 It’s the heir loom tomato flatbread that we had for a starter! Ben could seriously have not been more thrilled by this as he hadn’t wanted it to end! 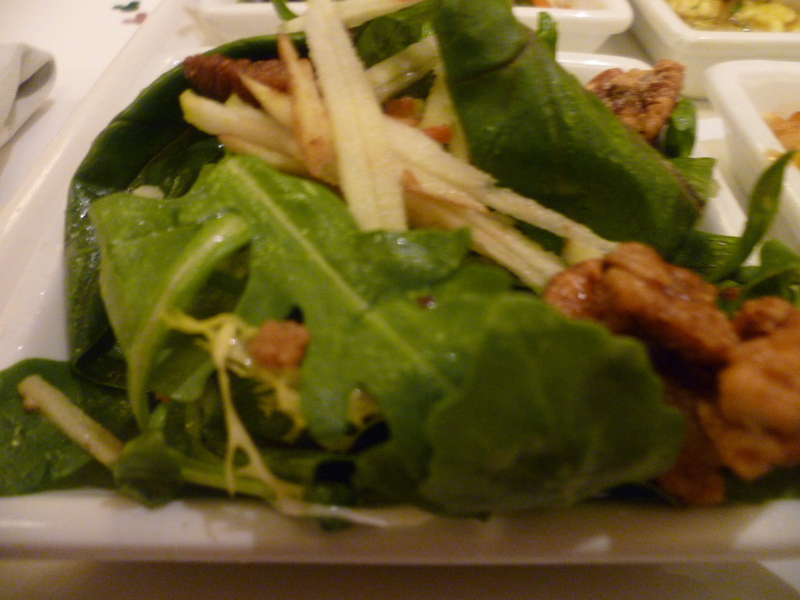 Bottom left – I think this was the Heirloom Apple Salad . . . Fourme d’Ambert, Spiced Pecans, and Apple Vinaigrette. Delicious! 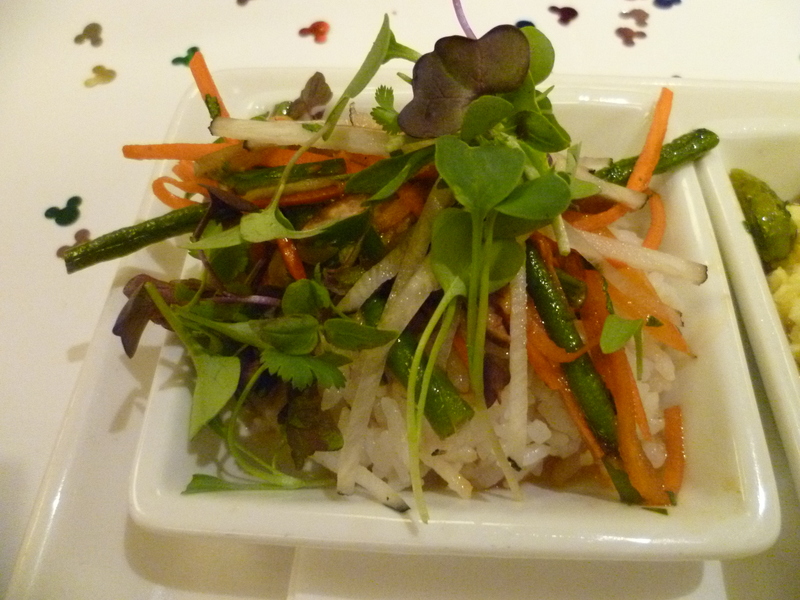 Top left – Can’t see anything on the menu that looks like this but I believe it was rice with lots of stirfried veggies on top with a soy and ginger dressing. Very refreshing and light. Phew! What a dish! We both ate every single bite of our mains even though I was starting to feel so full. 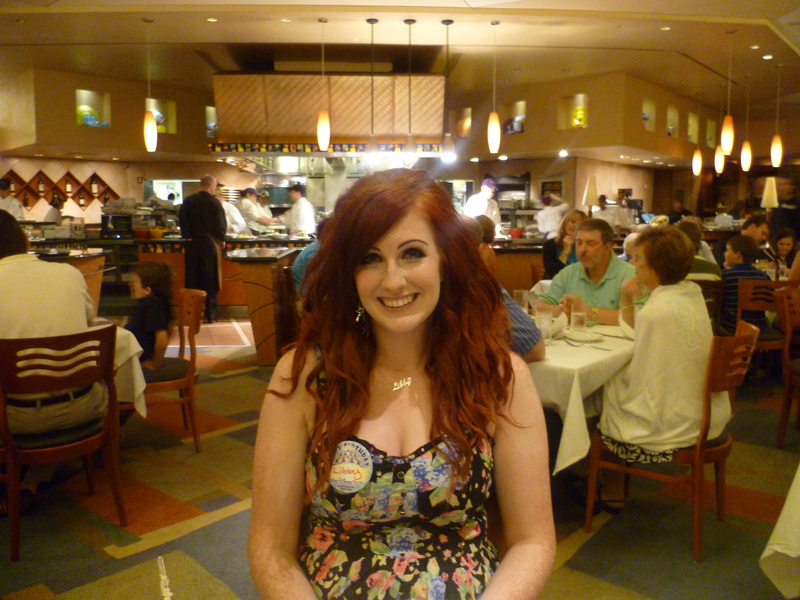 Even though we were both very full, we had desserts included as part of our Disney Dining Plan so we each ordered one before heading out onto the viewing platform that surrounds the restaurant. It was time for ‘Wishes’ fireworks! The view on the platform is really stunning and it was incredible watching the fireworks from such a great height. We had a perfect view and although it was a little chilly, it was very romantic snuggling up together to stay warm. 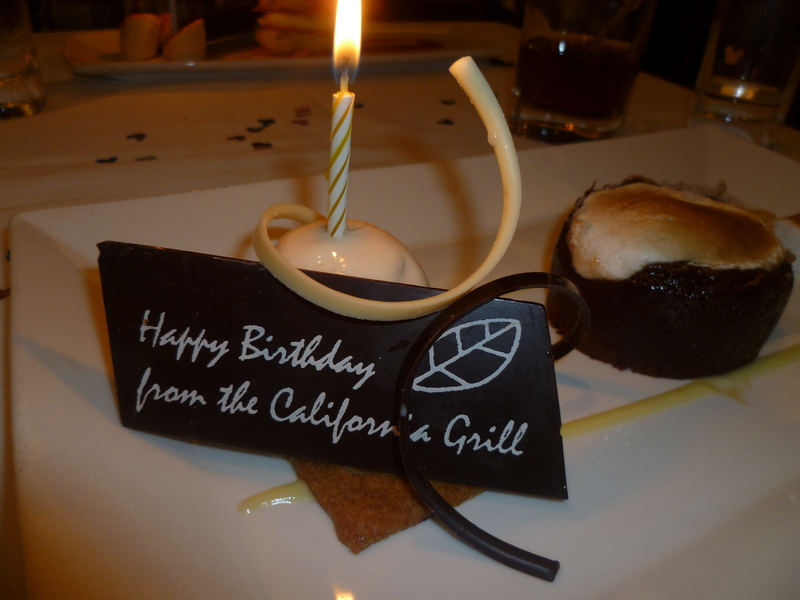 Once the fireworks were finished we headed back inside to our table to find our desserts waiting for us! Perfect! S’Mores Valrhona Chocolate Cake – Warm chocolate cake with molten center, Tahitian vanilla marshmallow, graham cracker sable, and peanut butter gelato. 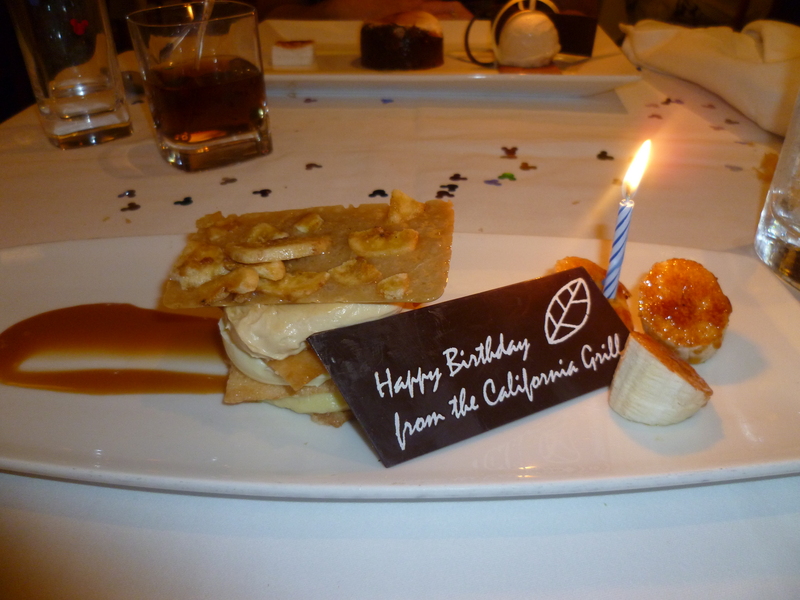 Bananas and Caramel – Crispy baked phyllo squares layered w/banana, caramel, mascarpone mousse, and caramelized banana. I took a couple of bites of my dessert and it was seriously amazing, if you like peanut butter even a tiny bit then this ice-cream will be your new best friend. However, I was really full at this point and had to take the dessert home with me all boxed up. Ben was able to eat the majority of his dessert and he really enjoyed it. We declined coffee and finished our drinks before paying the bill which cost us 2 x Table Service credits each on the DDP. However, if we’d have been paying ‘out of pocket’ this meal would have been incredibly expensive, my steak alone was $44! I’d visit the restaurant without the DDP in a heartbeat though as the food is just out of this world. On New Years Eve just gone, me and Ben were house-sitting for some friends of his Dad. As tempting as it was to go out, pay £20 to get into our local (normally free) pub, drink weak-but-overpriced cocktails all night, experience the anti-climax of midnight with people throwing up on the pavement next to us and then have to walk home because we couldn’t afford to pay £80 for a taxi, we chose to stay in. 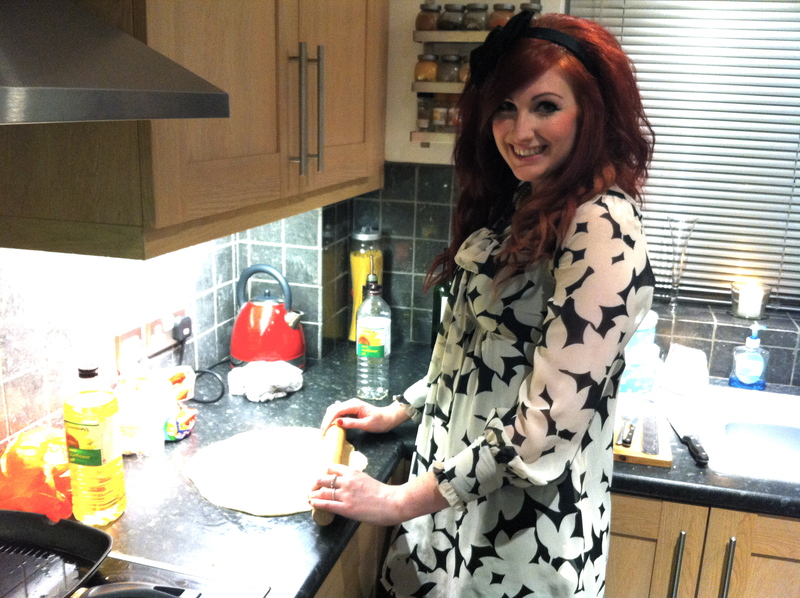 We decided to spend the evening in their cosy house, cooking a lavish dinner and drinking copious amounts of vodka. As we both still live with our parents (my dream of a polka dot kitchen all of my own is still very much a dream…) it’s really nice when we get asked to house-sit and can cook in the kitchen, especially this particular house as it has a gorgeous, 1950’s style kitchen with cream appliances and duck egg blue accessories and I just love it. We were originally going to cook a dish from Hugh FW’s Veg Every Day book that I bought Benj for Christmas but I impulsively decided I wanted to make potato dauphinoise, one of my very favourite dishes. I wanted to make something ‘meaty’ to go alongside it to counteract the creamy/heavy/carbyness, but we find this is quite difficult to do with vegetarian dishes. A lot of recipes involve cheese, lots are one-pot dishes that wouldn’t need a potato-based side and the rest are Asian/Oriental inspired. 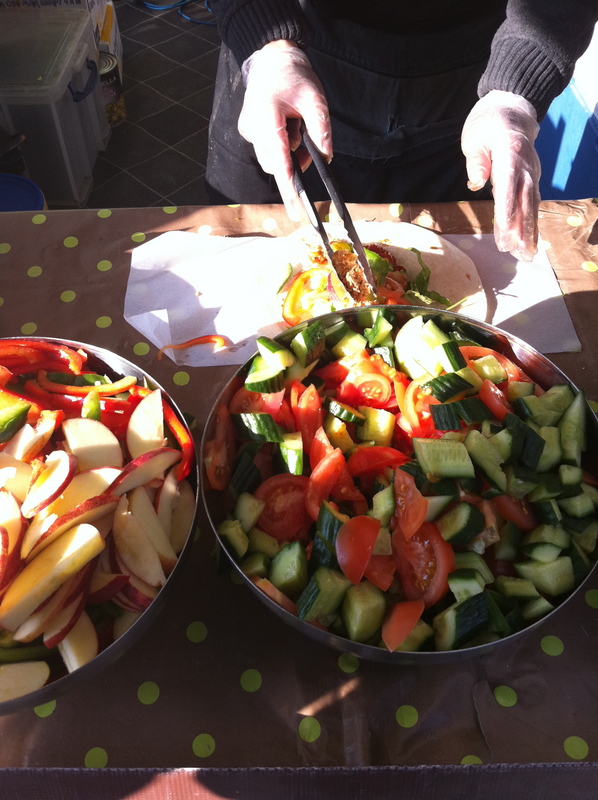 It seems to be hard to replicate the British “meat, potato and veg” dish in vegetarian food, purely because veggie food is so often more successful when the whole is greater than the sum of it’s parts (Quorn chicken fillets!) Quorn do a “steak” which is quite nice but I wanted something a lot more special for NYE. I think it’s the lack of ready formed fake meat that makes it tricky when wanting a ‘British plate’ as most of it is in minced or chunk format which needs to have more done to it than just slapped on the plate next to the side dish. Stuffed peppers would work, as would stuffed mushrooms, but I really am not the biggest fan of mushrooms unless they are very very finely chopped. Although, as you’ll see in this post, the times they are a’changing! We did consider buying tempeh and I even considered making it for a few ambitious seconds but in the end I decided a tart would suffice. Still more unnecessary carbs but we were getting desperate at this point! My Dad made Ben an awesome mushroom tart for our annual Boxing day bubble and squeak and meat fest and we wanted to recreate it. To cut a long story short, we made both the dauphinoise and the mini mushroom tarts and they were delicious. 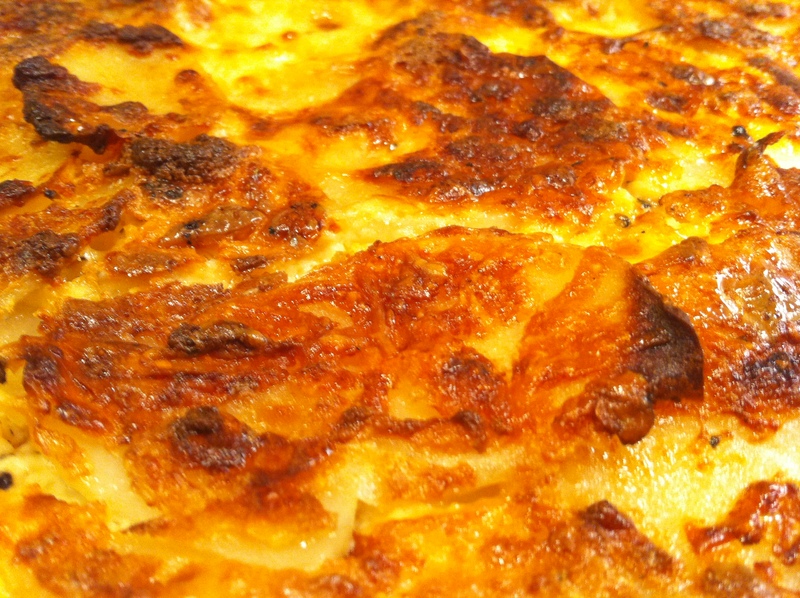 But, I overcooked the dauphinoise and it really annoyed me. REALLY annoyed me. Obviously, we ate all of it but ever since then I’ve been researching recipes and trying to figure out how and why I went wrong. I needed to make it again! 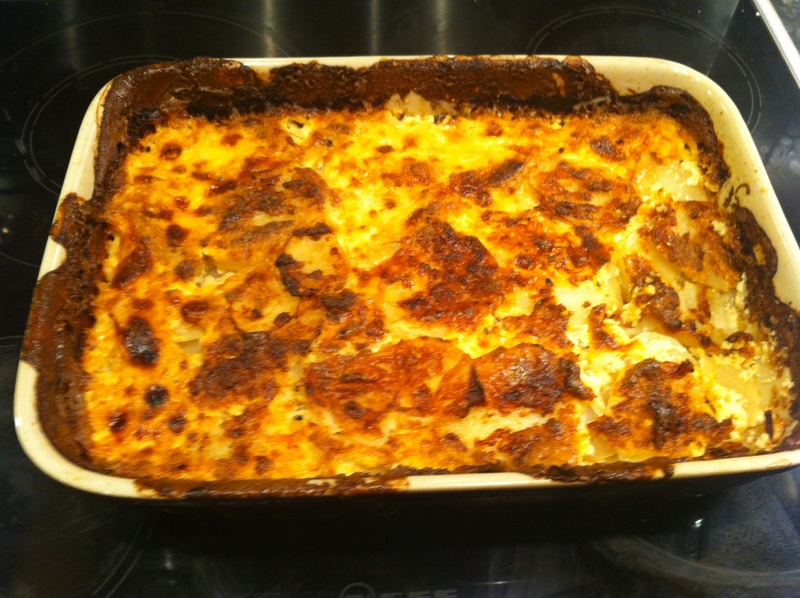 Dauphinoise take 2 occurred last Sunday. 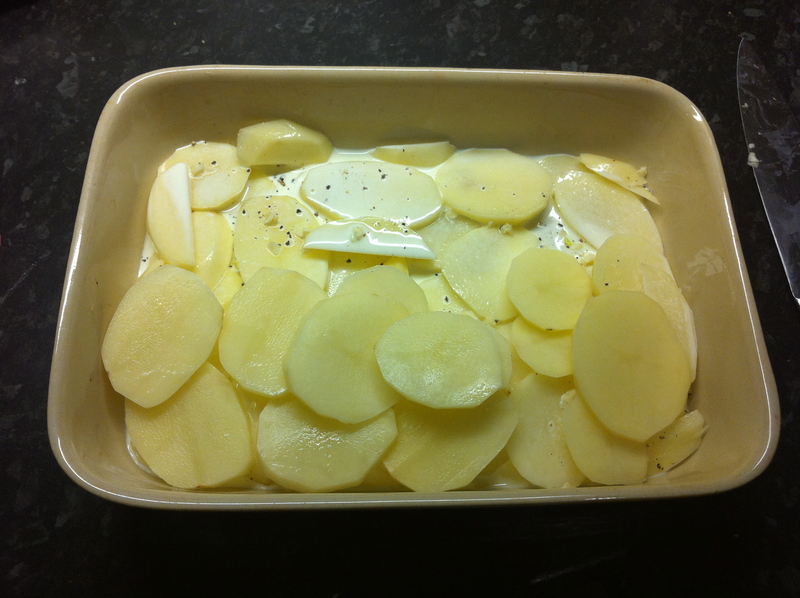 I bought all the ingredients again and launched into a second attempt at the dauphinoise. I knew that the first time, my mistake was putting the oven on too high so that the cream split immediately, causing a kind of unattractive spongy mass to form over the sliced potatoes, worlds away from the creamy, silky sauce I was aiming for. So, this time I was prepared to just take it slow, put the oven on nice and low and let it cook quietly away for a couple of hours. The end result? Good…but still not perfect! The cream STILL curdled even though I only put it on about 150. It was salvageable though as I pressed down so the potatoes absorbed some of the water that was produced when the cream curdled. In the end it all sort of came together quite nicely, albeit still lacking in the sauce department. Again, we managed to force down the entire trayful as we do not discriminate when it comes to potato-based foods…but I was still a little broken-hearted. Since my second attempt I have continued to Google extensively and came across a recipe that sounds to be pretty perfect, written by that founder of calm and collected cooking, Nigel Slater. He suggests mandolining the potatoes which is incidentally what I did the first time we made potato dauphinoise a couple of years ago and strangely opted out of these past two times. Although I like the idea of a satisfying bite of thick potato in each mouthful, it seems the very thinly sliced works better in this dish. 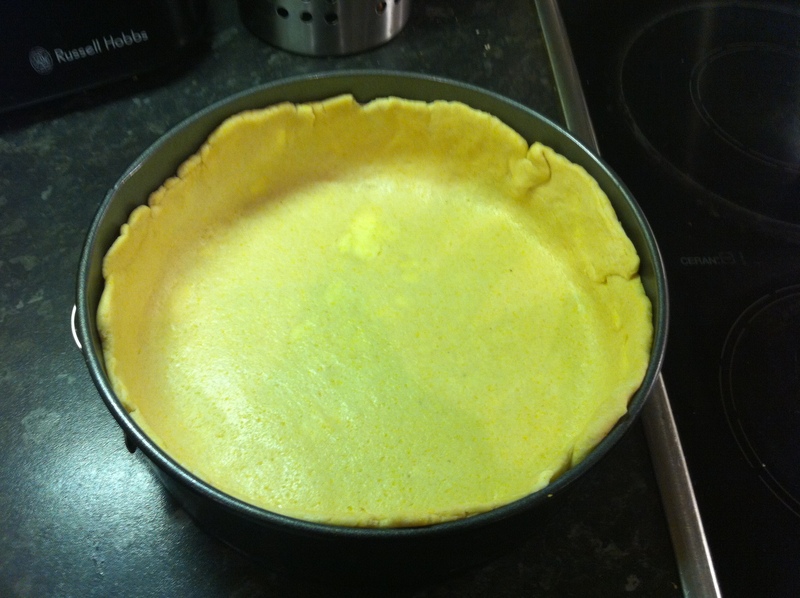 The tart this time was delicious with a much richer flavour than our first try. However, it was our first experience with ready-to-roll puff pastry and we unfortunately forgot to par bake it first so the bottom was slightly soggy. 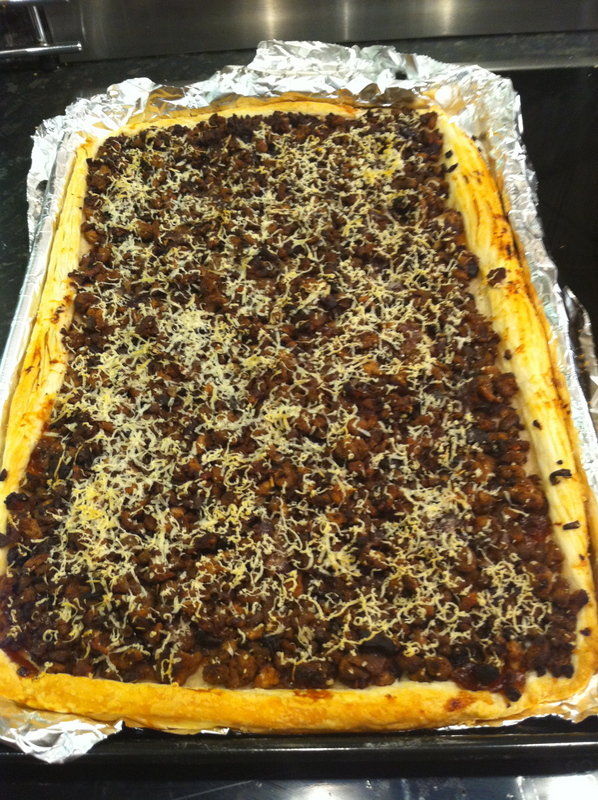 The filling was a lot nicer than our NYE attempt though; a simple mixture of chopped and caramelised red onions, very finely chopped button mushrooms (how brave of me!) and soya mince with lots of sage and rosemary. 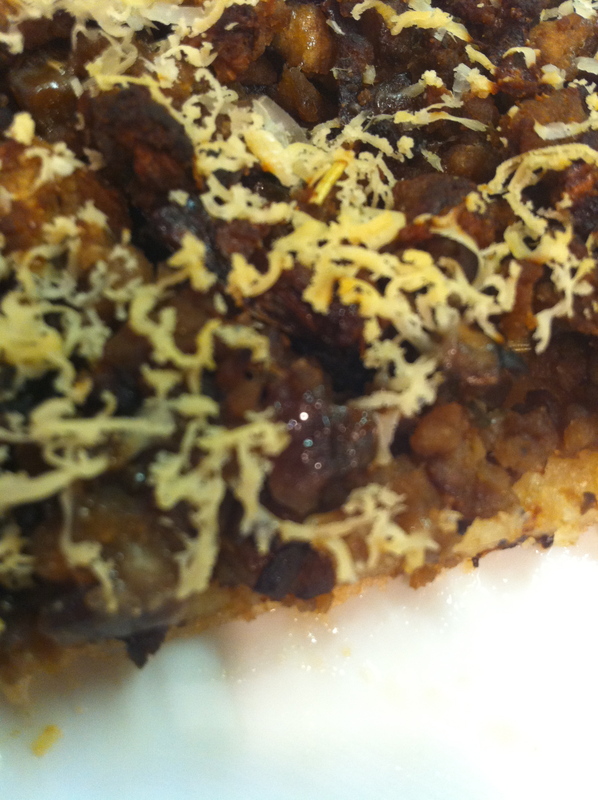 We also spread some caramelised onion chutney on the bottom of the tart which provided an intense hit of flavour. 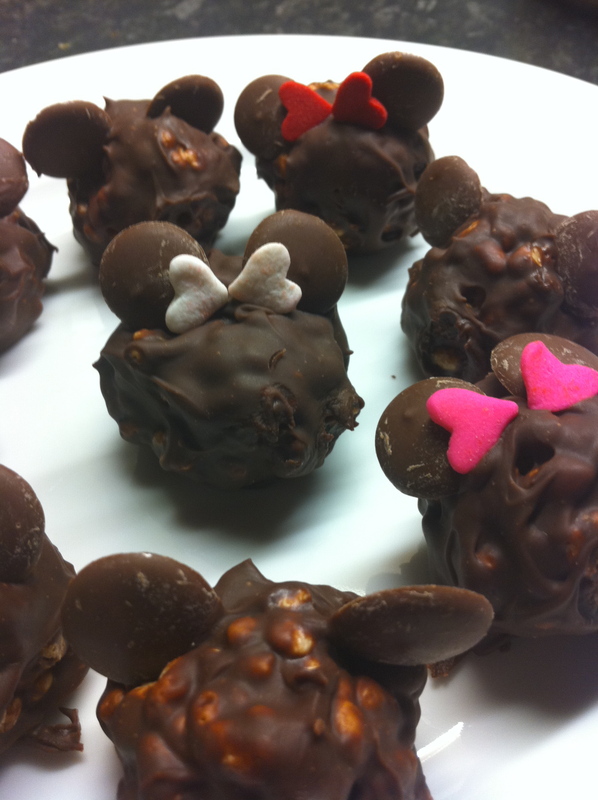 Next time we make these (and there will be a next time!) I think we will revert back to the original smaller size for a more photogenic finish and make the filling a bit more generous in each. 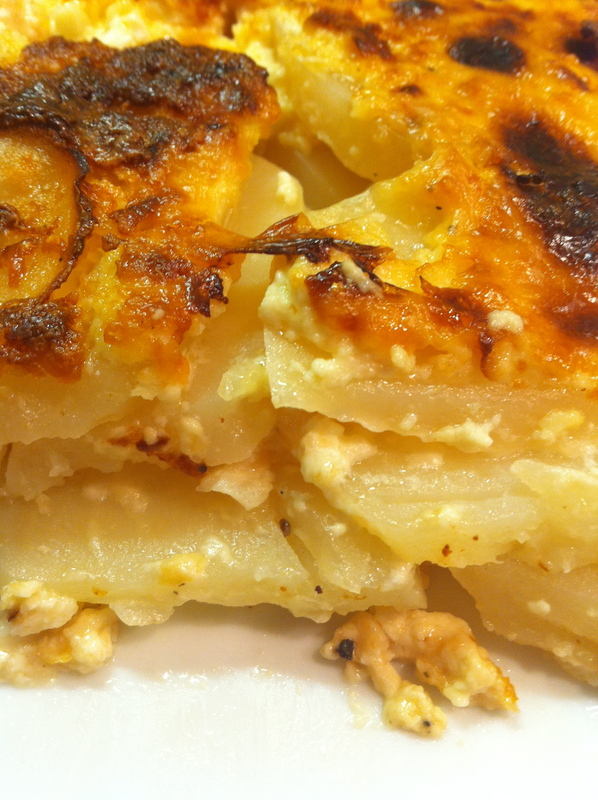 A final shot of the dauphinoise looking almost acceptable…I’m sure you’ll be seeing this again very soon as I just can’t stop thinking about it! The overexcited ramblings of a 20-something food loving, diet following, Birman kitten owning, village dwelling, Disney adoring bride-to-be. Currently following Slimming World and loving it!